This was the first official day of the Great Loop adventure because this was launch day. 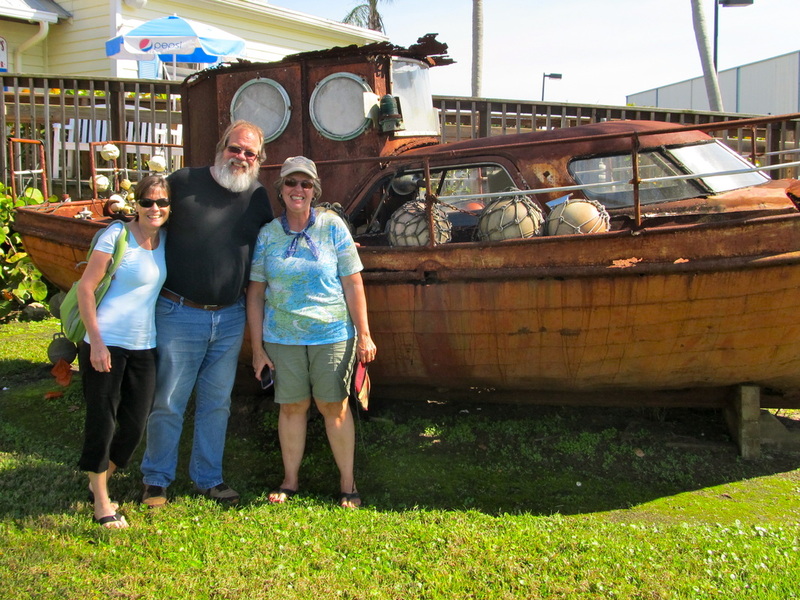 After breakfast and checking out of the Hampton Inn, who treated us well with a suite, a good weekly rate, breakfast and Wi-Fi included, we headed to St. Petersburg to the West Marine flagship store for a prop zinc. This 90-minute round trip was worthwhile as we got two prop zincs. When we arrived at George’s the stands that support the tug had been moved and the paint had been applied to these bare patches. 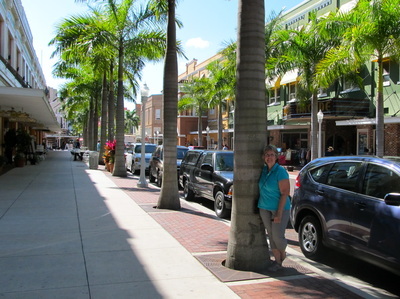 Laurie took the Dodge Avenger back to the Enterprise branch in Tarpon Springs. Meanwhile, I had put out the lines, re-arranged the fenders, disconnected the power cord, installed the new prop anodes, packed my travel things, and stowed items for cruising. When Laurie returned, one of the kayaks was blown up and the travel lift crew was arriving to launch Andiamo. A half-hour later, the tug was floating free, loose of the land, the stands and a trailer. We settled up with George and found the total bill quite acceptable; probably $400 less that what we would have paid in Everett. 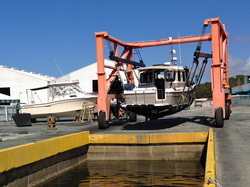 Andiamo was idling sweetly and tied to a dock. When the kayaks were tied to the roof and a light lunch was served, we dropped the lines and pulled away at 1PM with 388 engine hours. 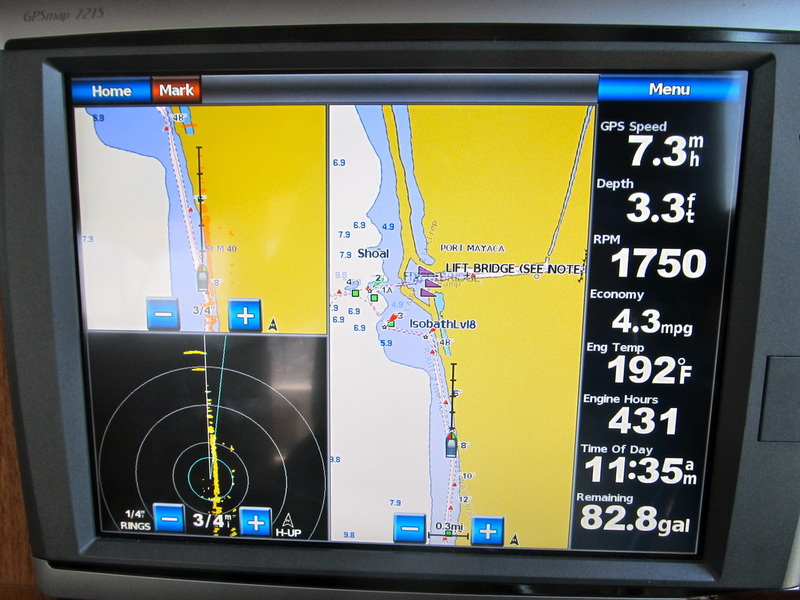 We headed down this river, staying between the red and green channel markers, with depths ranging from 3.5 to 8 feet under the keel and changing speeds from just above idle to the slow cruise speed of 7-8 MPH as the signs dictated. 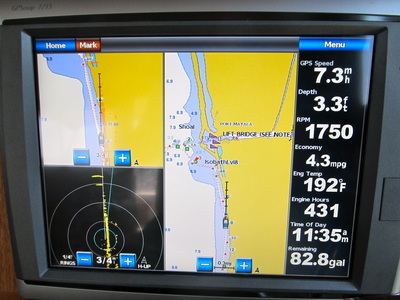 After the channel markers ended, the beginning of the Gulf Intercoastal Waterway started about a mile later and again we stayed between the red and green channel markers but upped the speed to our fast cruising speed of 16-17 MPH to verify that all of the mechanical systems were good. The tug was in her prime and hummed along through smooth waters, temperatures in the high 70’s, under partly cloudy skies with a huge fog bank looming about 5 miles to the west. The destination was a recommendation by Rich and Cheryll, Caladesi Island State Park, about 15 miles south of Tarpon Springs and is one of the few state parks that have a marina. We went under our first bridge and the workers stood at the rail and watched us clear this 24-foot clearance. 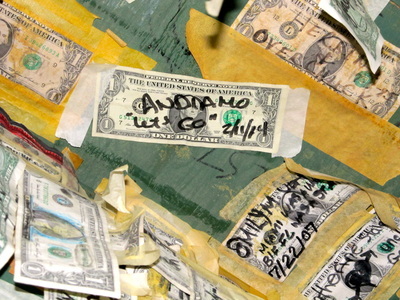 Were they under Andiamo’s Ranger Tug mojo or were they admiring the 12th Man flag? 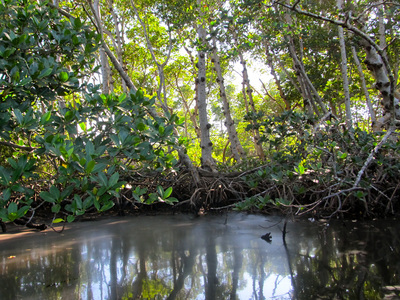 After the bridge, we veered to starboard and across a shallow flat with 1.5 feet under the keel toward the channel entrance of a marina that snaked through the mangroves. Caladesi Island is a barrier island that is a landmass with palm trees and mangrove that provides shelter to the mainland. 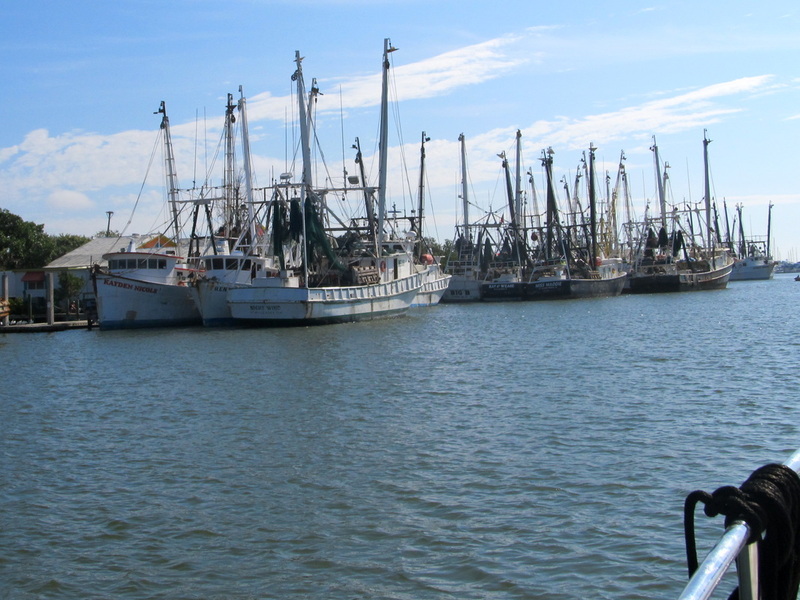 Between the barrier islands and the mainland is our southward route, the Gulf Intercoastal Waterway. Tight turns and shallow water brought us to a large marina with newer floating docks with power and water and all for $1 a foot. We quickly had to learn how to back into slips that have only 15 feet long finger piers and a lone piling between two slips to secure the forward portion of the boat. There is probably space for over 100 boats. Today, there were 8 boats. First, we did a successful landing at slip number 6 until the tide chart revealed that there was not enough depth under the keel for the predicted drop of 2 feet. Then, we had our second lesson in backing into short slips and making use of the lone piling as moved to slip 56. 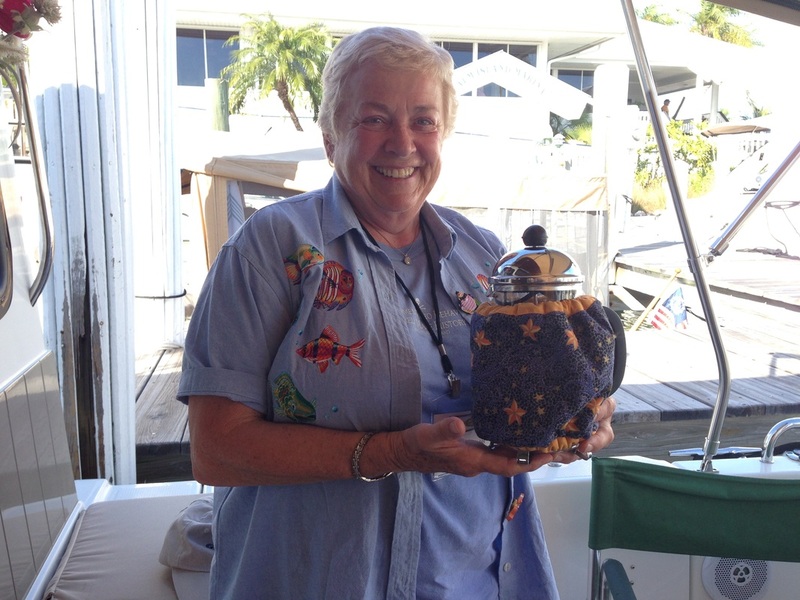 We met the park volunteer who lives aboard one of the boats, paid the moorage, Laurie did a clothing change to fit the cooling temperatures, and we walked to the beach and the Gulf of Mexico. There was virtually no surf and the water temperature was cool. The fog bank had come ashore with billows of mist rolling across the water, sand and palm trees. We celebrated our first day of cruising with a special dark beer from Deschutes Brewery of Bend, Oregon, Black Butte XXV, and grilled brats and had steamed broccoli for dinner as the sun faded into the fog bank. 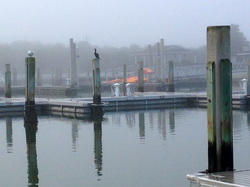 Dense fog shrouded the marina as the bright orb rose in the sky. They do fog really well in Florida. There was so much water on Andiamo, that it looked like that she was hosed down and it did not evaporate until well into the afternoon. The visibility was acceptable for us who are used to and comfortable with using radar. My minimum is being able to see about 100 yards and there was that and more. The tide was too low, with only inches under the keel, so we waited. 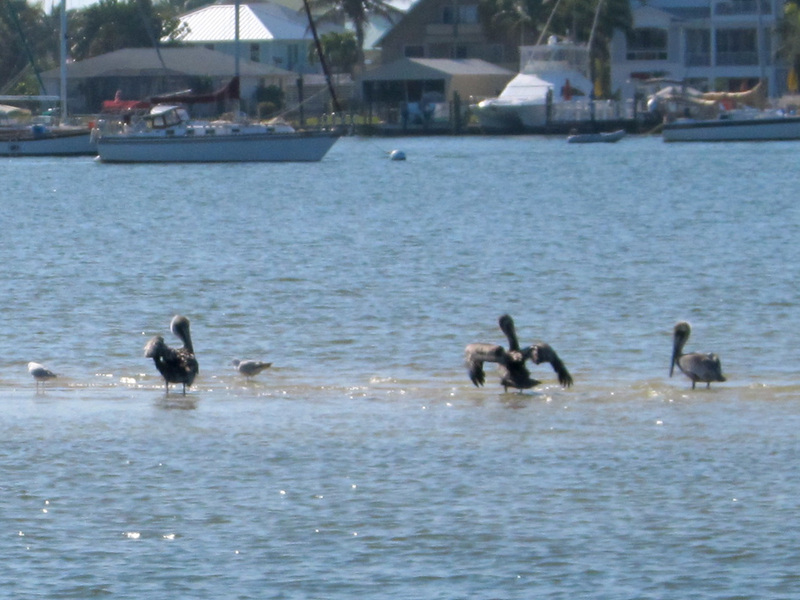 The marina was quiet all morning with the only sounds of the pelicans and anhingas diving into the shallow water for their meal. 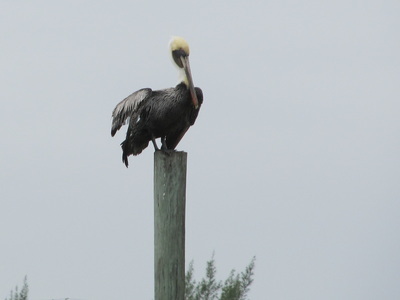 Then, they would stand on the pilings and enjoy the moment. 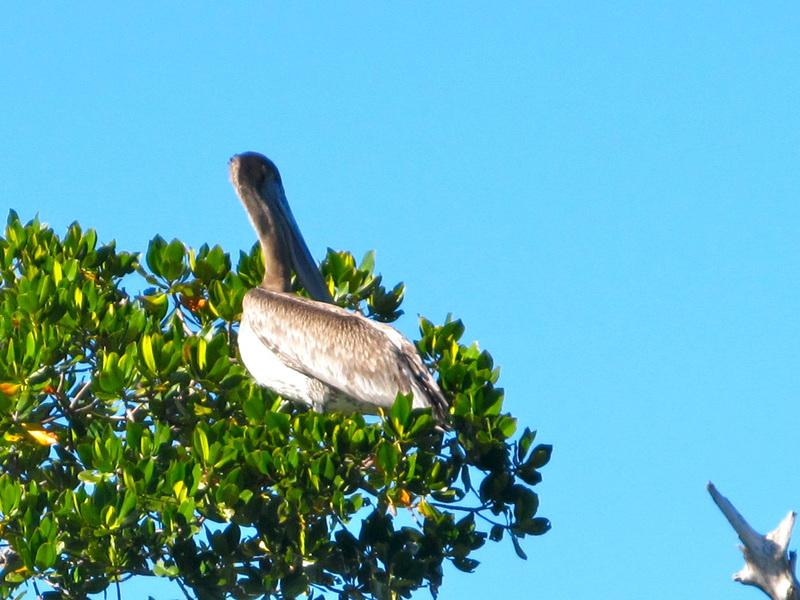 The anhinga would spread their wings, drying them so the routine could be repeated. Small projects occupied the time after a superior breakfast of scrambled eggs with salsa. The tragedy of the moment was the breaking of the drip coffee pot. Starbucks Via will have to do until it can be replaced. The clips that hold the rope lights that had broken away were secured, the depth sounder and keel off-set distance was adjusted to provide better accuracy. It was fine with we were in the triple digit depths of Puget Sound but when the depth is 3.5 feet, I wanted more accurate data. Also, the depth alarm was turned on, a good thing because it came in handy twice later in the day. The Active Captain website was further explored and two reviews were posted. At 11:15 AM, we pulled away from the dock and idled out through the rising fog, skirting across the bay and re-uniting with the ICW. The weather and the conditions were great and we decided to stretch out Andiamo’s legs after being confined to the dock for the past week. Our destination was anchorage that boater-friend Jim Favors had told us about via email, an anchorage near St. Jean Key, adjacent to a county park that is off of the ICW and within site of the huge bridge that crosses Tampa Bay. Boating the ICW is somewhat like coloring with numbers; you just stay between the red and green channel markers and watch the depth and speed because the speed limits change and the shallow depths can sneak up on you. During our 4-½ hours of running, the depth changed from skidding across the mud to having 15 feet under the keel. We headed south through Clearwater, Gulfport and ended near the opening of Tampa Bay and went under 9 bridges ranging in height from 20 feet to 75 feet. 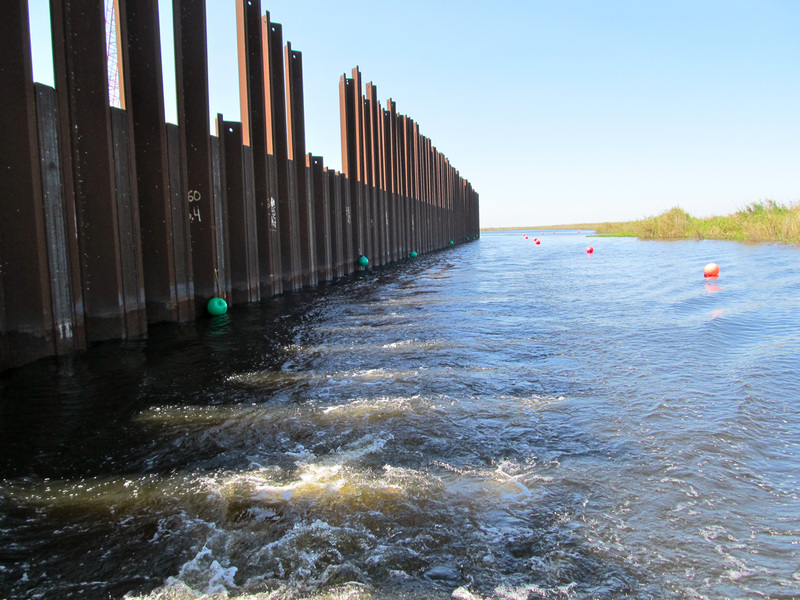 The bays were wide and long but the ICW channel could be quite narrow. Other times, like the Clearwater Narrows, we were in a narrow channel with low speeds and the Gulf of Mexico was only a block away and we were surrounded by condo, high rises and high-end boats that were lifted out of the water on their private docks. A highlight was the dolphins that jumped the boat’s wake and swam right along side of us. What a joy to see them and we couldn’t help feeling that they were really just enjoying themselves as they jumped completely out of the water in the water’s foam! 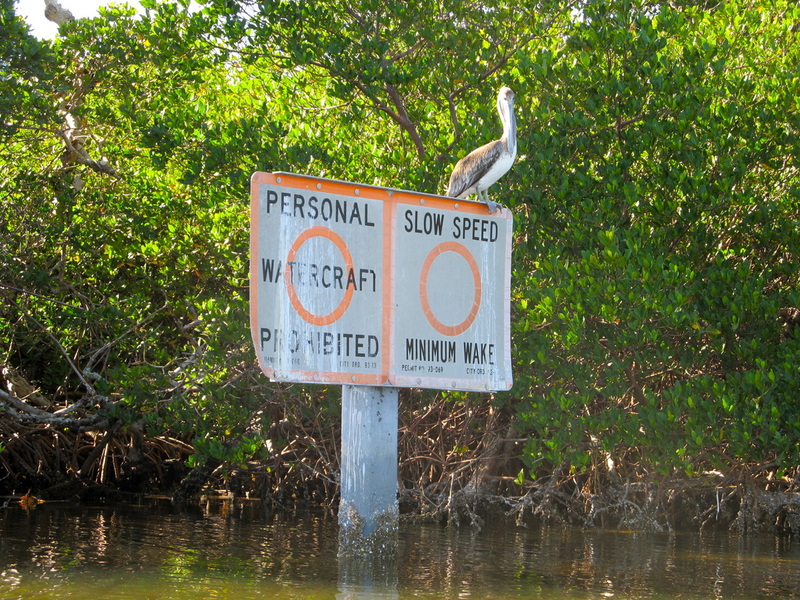 The speed limit signs are: Idle Speed- No Wake; Low Speed-Minimum Wake; and Resume Normal Operations. Basically, it is all subjective and interpretive. All the bridges and the high-end residential areas are Low Speed. So, when the Gulfport PD Officer turned on his stealth boat’s blue lights, I knew the speed sign was Low Speed-Minimum Wake and the tug was making an 8-12 inch high wake at 8 MPH. I was pushing it and knew it. The officer was friendly and direct, I was going too fast and he said that a minimum wake is really no wake. I accepted the warning as given and then he asked about the tug and I had the feeling that he was feeling that Andiamo mojo and made the stop to ask about the tug. I was fine with all of it. Our speed this day was a variety. In 40 miles, our slowest speed was 6 MPH and our fastest was 18 MPH through the long straight stretches. We arrived at our intended destination at about 4:15 PM and dropped the Ultra anchor in 6 feet water. It set very quickly and anticipating a fresh breeze tomorrow morning with no protection from any elevation, we did a 5 to 1 scope. Then, we enjoyed BBQ chicken and a beautiful sunset. After breakfast, we reviewed the maps, guidebooks and the website Active Captain for the final information and made the decisions for today’s traveling. Then, the anchor was pulled and we set out as the fog had lifted. The whole day, the low clouds never fully cleared out but the temperatures where in the high 70’s. 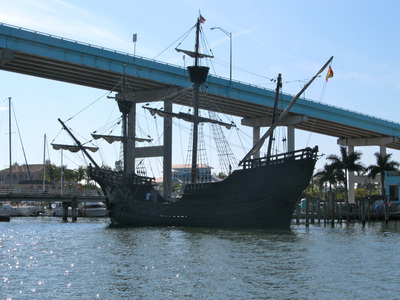 After leaving Fort De Soto Park, the reconnection with the ICW occurred about 5 miles later at the Sunshine Skyway, a highway that is lifted over the shipping channel at nearly the mouth of Tampa Bay. Surprisingly, the ICW is quite narrow in the massive bay as it approaches the shipping channel. The tug’s bow was pointed into the fresh breeze and the moderate chop as it followed the fabled magenta line on the paper and the electronic charts, across the bay to the opening and the connection with Anna Marie Sound that fed into the considerable length of Sarasota Bay. The tug had scooted across Tampa Bay at 16 miles per hour. 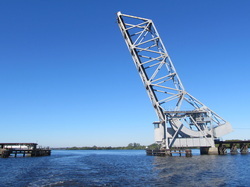 The northern portion of this bay is shallow and the ICW is a thin ribbon of navigable waters with depth at about 5 feet under our keel which was traveled about the slow cruising speed of 7-8 MPH and when the bay opened up, the hammer was dropped on the tug’s throttle all the way downtown highway bridge. Being only noon, the fancy marina and the legendary mooring field that are all expensive was bypassed. 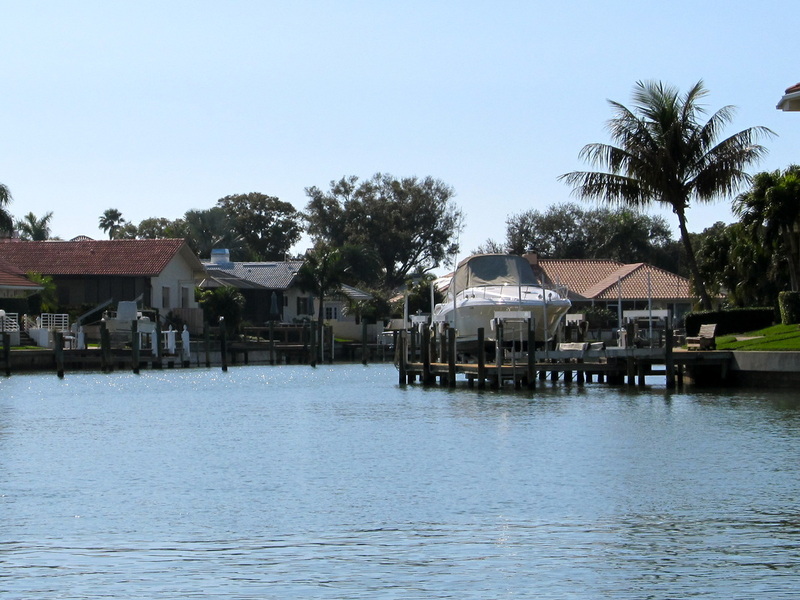 Under another bridge and several narrow connections later, Little Sarasota Bay was entered and though there are several anchoring opportunities, we opted for a marina to stretch out legs. 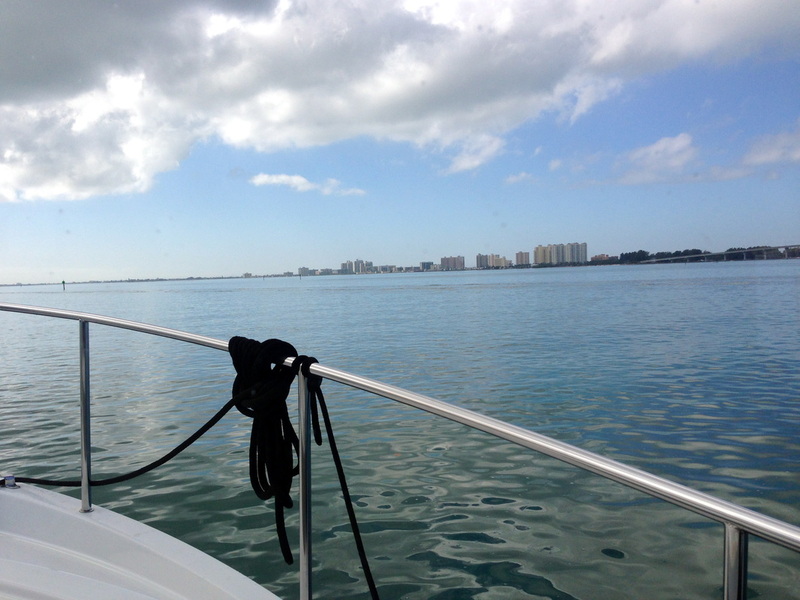 We moved off the ICW following a privately maintain channel and some very shallow water in search of Turtle Beach Marina on Siesta Key. This small operation is sandwiched between some moderately priced resorts and a popular restaurant and is mostly a dry storage operation, with a dozen or so boats in various stages of neglect. They had two slips for transient moorage and the tug nosed into the larger one. No power, no water and no amenities, but paying a $1 a foot was fine. We had gone 39 miles and went under 4 bridges. Then the fog swept in and within an hour the ICW was completely engulfed. It was a blessing to get off the waterway. We walked to the nearby Gulf of Mexico and the fog kept the visibility to a few hundred yards. Then, we walked down the main street past resorts, high-end houses and the occasional 50-year-old dwelling that was on someone’s list for demolition and re-development. We had walked 2 ½ miles. After puttering around on the boat for another hour, shrimp was grilled on the BBQ and another bottle of Pipeline Porter from the Kona Brewery was opened. We slipped the lines and idled out of Turtle Beach Marina about 9AM under the continuing pattern of low clouds. Not that we are complaining because the homeland is very cold. We immediately came to our first bridge that needed opening as it had a 10-foot clearance. After Laurie called the bridge tender on channel 9, we watched him activate the gates that blocked traffic and then he left his small building on the edge and walked to the middle of the bridge and got into a small cage where he turned the key and pulled the levels that brought the machinery to life that caused the bridge to swing open. Then. more cruising through the neighborhoods of the rich and famous before we entered Venice. As the tug entered the small bay before Venice’s tall bridge, we saw our first Manatee from our boat. Venice has a nice feeling or vibe about it. Not too upscale, real people in comfortable housing and the natural area looks genuine, instead of being imported from somewhere or the result of a design committee’s compromise. We travelled long expanses of bays and learned that we had been incorrect about the name of these waterways. 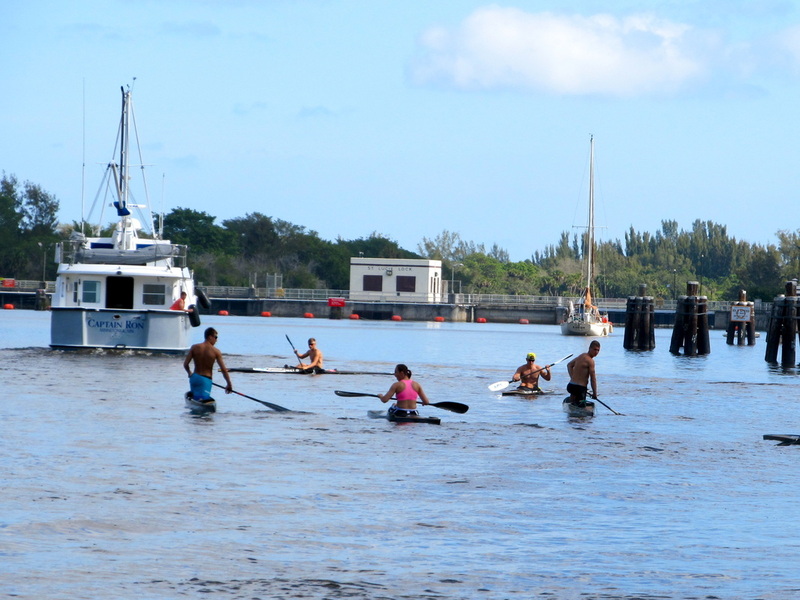 This is not the INTERcoastal Waterway, rather this is the INTRAcoastal Waterway. People call it the Intercoastal but that is a mispronunciation of the word. The safest bet: just say ICW. On the west coast of Florida, the Intracoastal Waterway is separated from the Gulf of Mexico by a string of keys and barrier islands. At 1PM and 30 miles later, we arrived at Palm Island Marina near Cape Haze where the two dock hands tried to do everything from tying up your boat to plugging in the power. They were politely told that we are self-sufficient and can take of this. Then, the socializing began and for the next 7 hours, we had great conversations with a number of people who we have known, or emailed with, or read their postings on the web or were just new to us. Palm Island was the first scheduled date on this great adventure and we made it. When there is no car, the realization occurred about how many decisions and designs are made around the car. Errands and tasks that would take an hour now take a half a day or more. Getting a French press coffee maker would be a 45-minute task in Seattle had become a multi-day event. Who has one, where can it be acquired, who has a car and is willing to do this and when can it be on the boat are all relevant questions. Toni came to Laurie's aid by volunteering to drive to the Bed, Bath and Beyond store in Port Charlotte to get the french press. When it arrived, our morning routine was back on track. Laundry was done, water was added but most of the time was showing the boat and it’s modifications and learning about the owners, places to see, and making friends. We gleaned useful information from the veterans of Florida boating and this revealed a vague plan for the next week or so. We helped other owners with issues and suggestions on their boats and received assistance on our boat when the mixing elbow in the engine was due for an inspection and that resulted in finding that the fuse to the automatic bilge pump had blown. One time, I looked up from my bilge and not only saw Rich and Mike who were helping from the start but also 4 others on the dock who were spectators. The group dynamic was helpful and entertaining. There were interesting presentations by Rich and Cheryll on cruising Alaska, what apps owners are using, Garmin talked about their product, the Coast Guard Auxiliary did courtesy safety inspections, Jim and Lisa talked about Lake Powell, and the raffle was entertaining. These owner rendezvous are great but the for leaders they are work and we know from first hand experience. This one had 21 boats and was the perfect size. Carol, Ted, Mike, Jess, Rich and Cheryll did a great job in having enough structure to make it interesting and providing the right quality of logistics. Skies were clear and blue and the temperature was climbing past 65 when we had breakfast at 8AM. 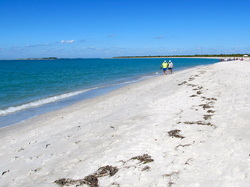 Twelve tugs were going to the Cayo Costa Island State Park to tour, have cocktails and then anchor out individually. Between breakfast and the captain’s meeting at 9AM, Andiamo was readied for cruising. The group of tugs would travel together at least through the swing bridge that was 5 miles south of the marina because the bridge only opens on a scheduled basis of the top and bottom of every hour. Not our favorite way of traveling but I saw the necessity in it. We bought 17 gallons of diesel at a moderately high price because we were within our 1/3 tank reserve and the tug needed the holding tank pumped out, the holding tank was just over half full at 7 days and the cost was $10. We pulled away from the dock at 9:30 and idled down the ICW as the remainder of the tugs slipped their lines. By 10:15, the flock of tugs, R-25, R-27, R-29 and R-31 were doing hull speed toward the bridge, which opened for us at 11AM and the group went past the fisherman working the pilings and the boats who had turned to go into one of the marinas at Boca Grande. Schools of dolphins played in the wakes as the red and green channel markers where kept between. 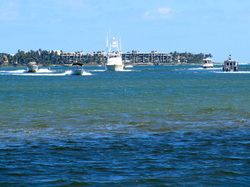 Most of the tugs powered up for the crossing of Port Charlotte Bay and the Boca Grande Pass. At the red buoy 74, a sharp turn to starboard was performed and the shoal from the tip of Cayo Costa Island was avoided at Pelican Pass. The anchorage is huge and charts clearly mark the 2-foot depth to be skirted around. The tugs all spread out and anchored in 6 feet of water and easy dingy distance to the state park dock. Denny’s tug, the Charlotte Ann, found a slip from the few available. After lunch, the kayaks were dropped from the roof and we paddled ashore to take the park’s truck towed tram the mile ride to the beach on the gulf. For over an hour, we walked the beach and the edge of the nearly calm gulf that was without surf or clouds. 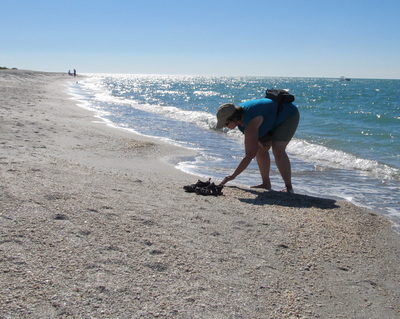 Laurie was in her element, shuffling through the sand and stopping every 10 steps to pick up a new shell. 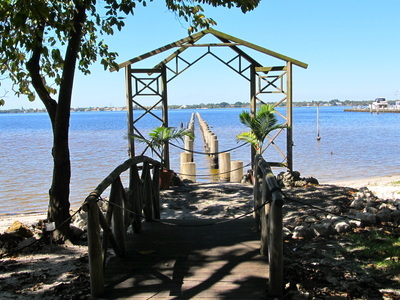 This park has some opportunities for campers who arrive by boat or ferry. The terrain is clearly a desert with scrub palms, cactus and plants that can thrive in the sun and the heat. We walked back to the tiny visitor center and the smaller gift store, chatting with the employees. 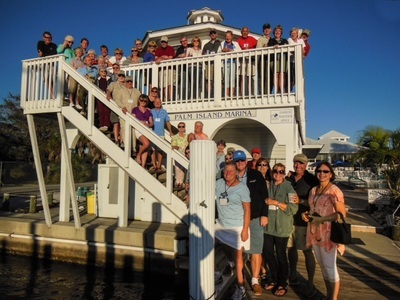 After paddling back to Andiamo, preparations were made for a cocktail party on a Ranger 31. We decided to not paddle over in the kayaks and accepted a ride from one of the dingies. There were 22 people on this boat and though it was crowded and shoulder-to-shoulder, it was surprisingly comfortable. There was more food that necessary and we all sang happy birthday to Jim Favors. As this final gathering broke up after the sunset and before darkness fell, it was clear that friendships were made. 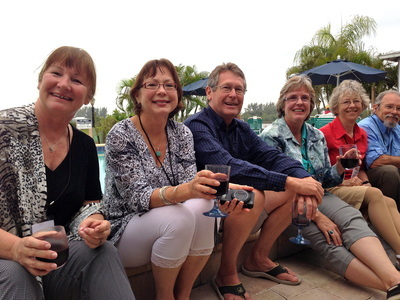 Some owners we would probably never seen again, others joined that short list of whom you just connected with and the friendship would endure. Some envied the trip that we had started. The look in the eyes of others revealed that they could never fathom doing it. The wind came up a bit last night that caused more chop than we had previously known on Andiamo. The noises of the straining chain on the deck gear right above our heads were new and therefore called for attention. The bow pitched up and came down with enough power that Laurie woke up twice to the new sounds and raised an alarm. But the anchor did not drag; it was all about us and not about the boat. The morning skies were clear and the air was nearly dewless. Bruce and Myra and already left and soon after the Charlotte Ann was gone. By the time our anchor was pulled at 10 AM must of the tugs had left Pelican Bay and the tail end of the rendezvous was over. 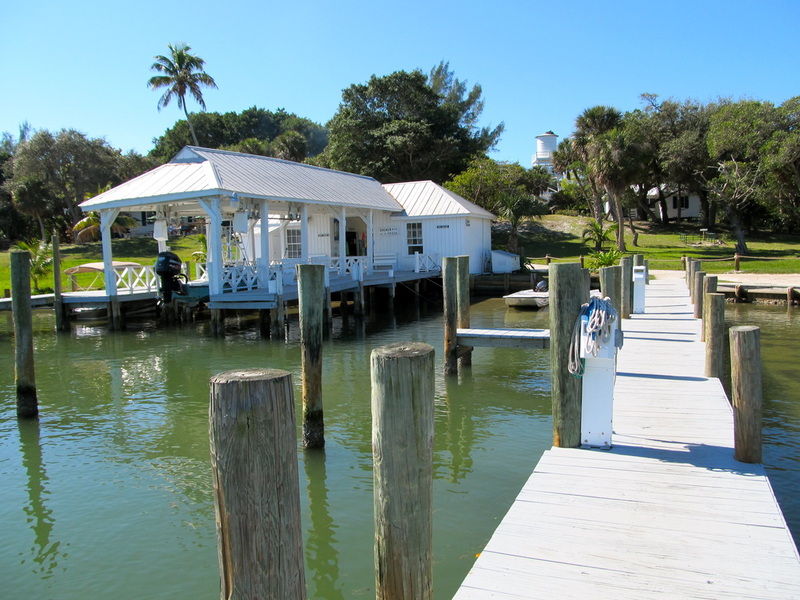 Our destination was Cabbage Key and their renowned cheeseburger. 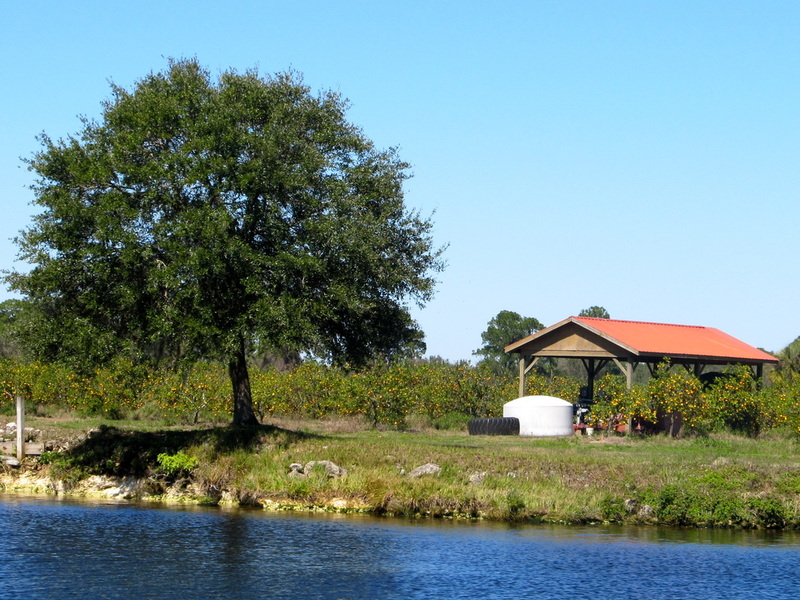 This is a small island with a marina, a restaurant, and a handful of cottages to rent. 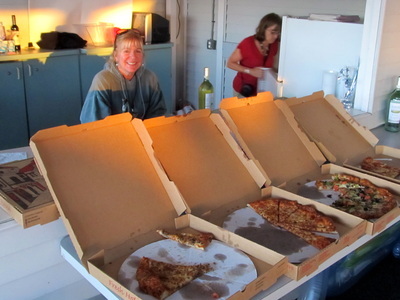 Their bread and butter is feeding lunch to sportsman and cruisers. Apparently, Jimmy Buffett was inspired to write “Cheeseburger in Paradise” after coming there. The other unique part of their brand is the “money room” where there are thousands of one-dollar bills taped to the walls and ceiling with notes on them. It was only five miles away and we arrived within the hour where the harbormaster was really an usher, gesturing and directing the incoming boats into a variety of slips. The daily lunch rush started at 11AM and we were just ahead of it. The tug was backed into a slip with pilings and no finger docks and tied off. Rich and Cheryll and their tug Roam were already there and we met them in the restaurant were the considerable wait staff was poised for the rush that was about to happen. 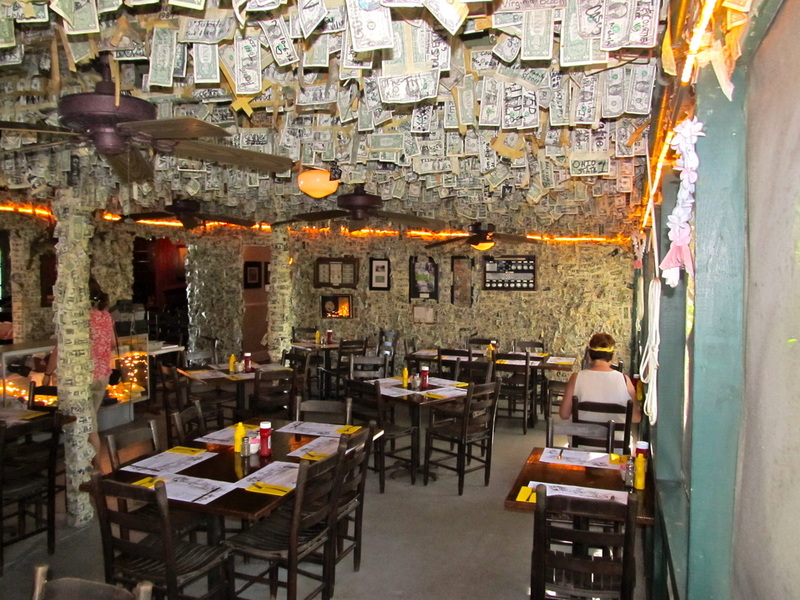 We had a nice meal of cheeseburgers and homemade potato salad and we taped dollar bills to the growing collection. Rich and Cheryll said their goodbyes as a friend’s private dock at Sanibel was calling them to spend the night. 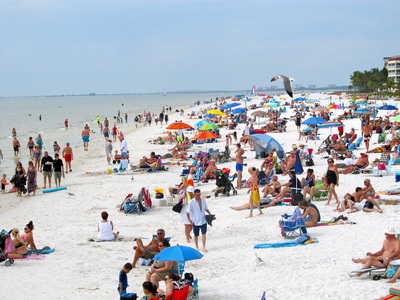 We would probably see them in a day or two at Fort Myer’s Beach at a marina to wait out a cold front with rain and wind that was forecasted for Wednesday and Thursday. The small island was crammed with boats and people waiting on the lawn for a table. A steady stream of small and large boats were lined up in the small channel waiting for a spot. 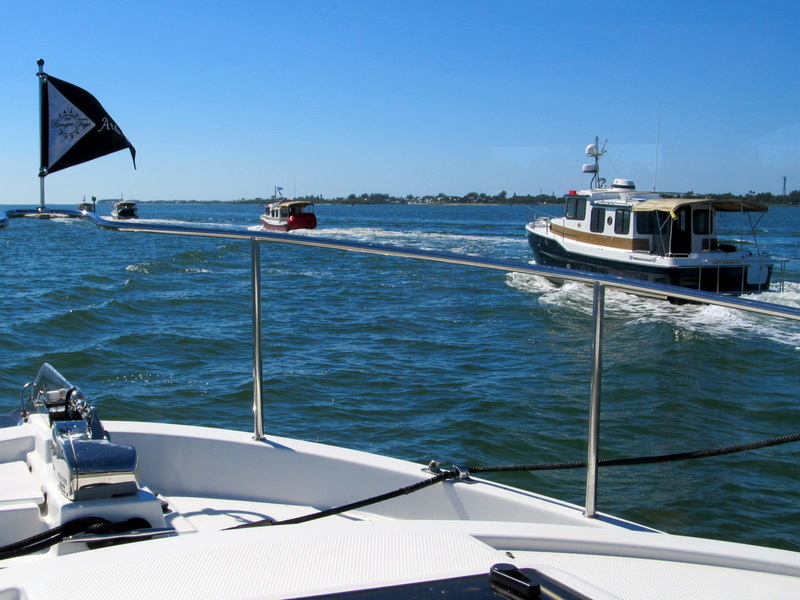 It was very entertaining as boats eased into each other with skippers of various skill levels at the helm and the harbormaster jogging from boat to boat between his non-verbal orders. The short nature walk around the island and the climb up the original water tower was worthwhile. After Laurie bought a top at the gift shop in her continuing quest for more comfortable clothing, Andiamo’s lines were slipped off the pilings and we idled out to the ICW to turn south and head for national wildlife refuge on Sanibel Island. This was a very busy boating day as we encountered more boats than any other day of this trip. 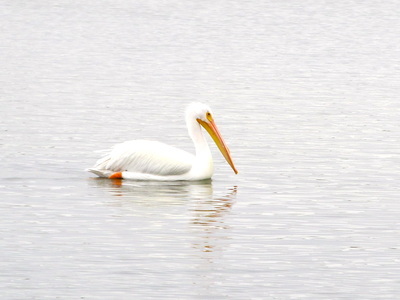 The ICW is a narrow channel in the wide and long Pine Island Sound as it avoided shallow areas. The mainland was on our port and North Captiva, Captiva and Sanibel Islands were on our starboard. In this wide expanse of water, Andiamo was powered up to her fast cruising speed of 3450 RPM where she slid across the broad and flat water at 18 MPH, drinking fuel at 2 miles per gallon and 9.8 gallons per hour. 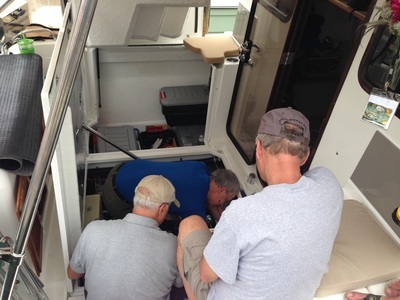 Putting her bow down with the trim tabs and using the bubble level in the cabin to tweak the side-to-side trim resulted in more efficiency. After 30 minutes of running at this speed we caught up with Roam near our turn off to the Ding Darling National Wildlife Refuge. Two miles off the ICW channel, the tug was anchored in 5 feet of water knowing that the minus tide in the morning would leave only 18” under the tug’s keel. After being comfortable with the anchor’s set, the inflatable kayaks were dropped off the roof and we paddled into the mangroves, skidding across the few inches of depth, and slipped into a narrow channel with junctions to the port and starboard. Clearly, if we did not pay attention, it could take awhile to find our way out. 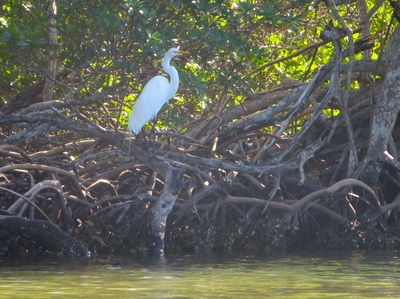 With the kayaks, we glided past napping pelicans, spooked egrets, white ibis, and herons. Fish were jumping out of the water and Laurie spotted a ray gliding across the bottom. There was no talking, only gestures as we both felt the need to be very quiet in this magical place. An hour was spent gliding on the edge of the mangrove before reuniting with the tug where the kayaks were easily put back up on the cabin’s roof. The afternoon was closed with showers for all to take advantage of the water heated by the engine, glasses of “Seven Deadly Zins” with crackers before a light dinner of taco salad. The early warnings of the approaching cold front were the high clouds and a shift in the wind’s direction from the south to the west. The front had been coming south out of Canada for several days and it affected our plans. Adjustment and adaptation are key themes for this adventure. A safe harbor was the goal of the day. 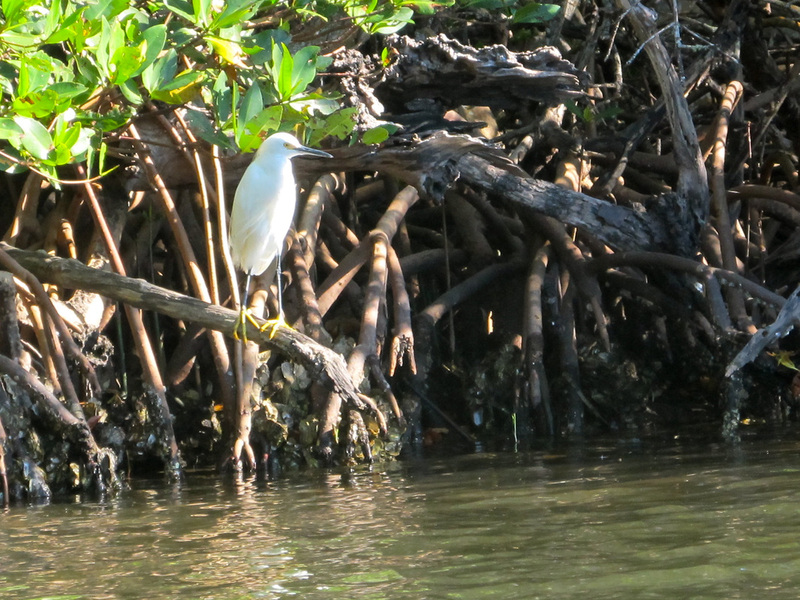 The tide had bottomed out and was rising again but the waterway path into the mangroves that we used yesterday now was a bank of mud that hundreds of egrets and ibis were using. 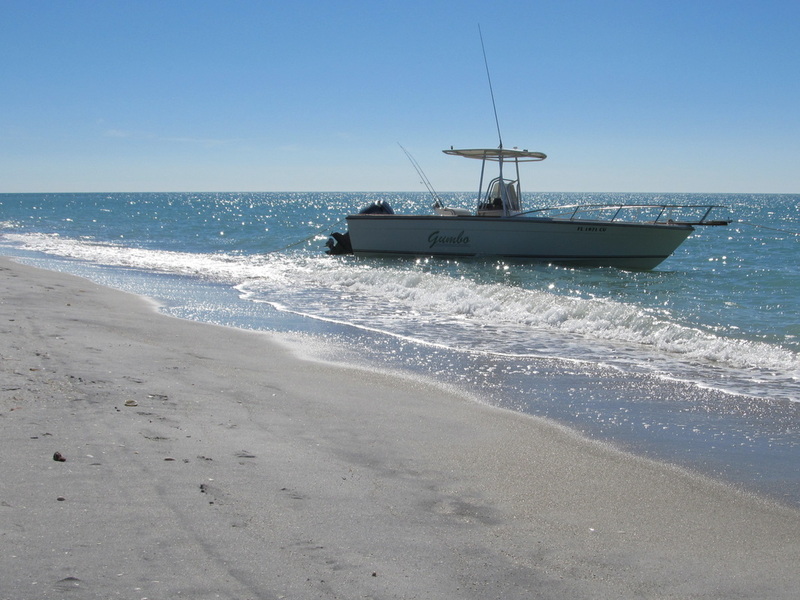 After a breakfast of oatmeal and coffee and the daily boat chores of cleaning the windshield and wiping down the dew, the anchor was hauled and Andiamo headed back to the ICW with Fort Meyers Beach as the destination. 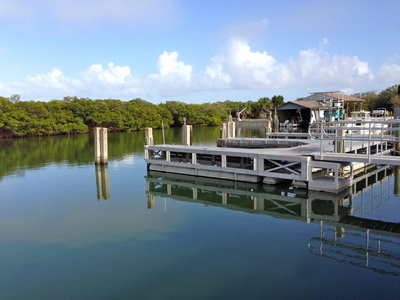 Rich had recommended the Salty Sam’s Marina as it was more protected than the other marinas from the forecasted 20-25 MPH winds and thunderstorms. 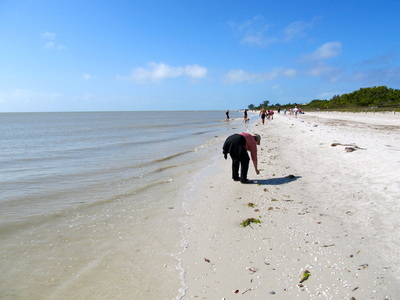 Our path was not straight, having to break free of the ICW, go around shoals, under the bridge at Sanibel Island, and into open water to cross the bay and find the entrance markers to Fort Meyers Beach. The winds had risen to about 13 MPH and the chop across the bay was 1-2 feet with an occasional 3 footer. 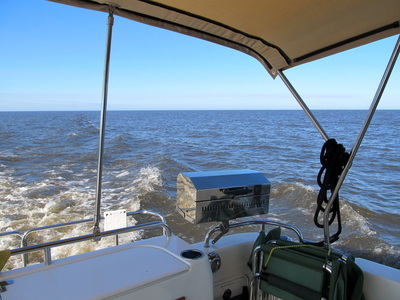 But the heavier hull of the Ranger 29 made the ride more comfortable that we had on the 25-foot Laurie Ann. 10 miles and two hours from our departure, we arrived at the long line of red and green channel markers that keep boaters off of the shoals. 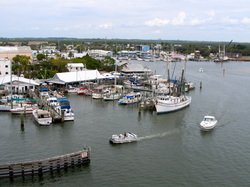 The harbor at Fort Meyers Beach is lined with marinas and after going under the bridge, we turned left to find the Ballard Oil Company that was recommended to us as the cheapest price for diesel. Their dock was empty and quiet as the tug was swung around and placed up against the pilings. Laurie called the number on the wall and the owner and sole employee cheerfully came from his nearby office to help pump the 70 gallons that Andiamo thirsted for. The owner called himself the “Fossil Man” and said that his business was founded on supporting the shrimp fleet. The 200 boat fleet had diminished to 40 and he said the cause was the high price of diesel. He was talkative and friendly and we stayed at his dock for another 30 minutes, as the marina had preferred that we arrive in the afternoon. The marina put Andiamo at the head of dock of 40-foot long slips, which we were glad to have but were puzzled by the management of the marina. 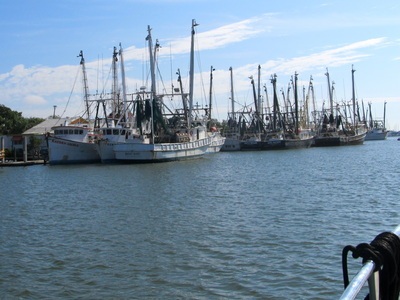 Shorter docks were empty and available, yet smaller boats were occupying nearly all of the long docks. The staff told us later that they were nearly full for the next two days, and yet whole sections of docks were empty. A live band was playing for the lunch crowd on the outdoor patio that had a view of the marina. The restaurant was advertising “Michigan Day” which was appropriate for Rich and Cheryll. 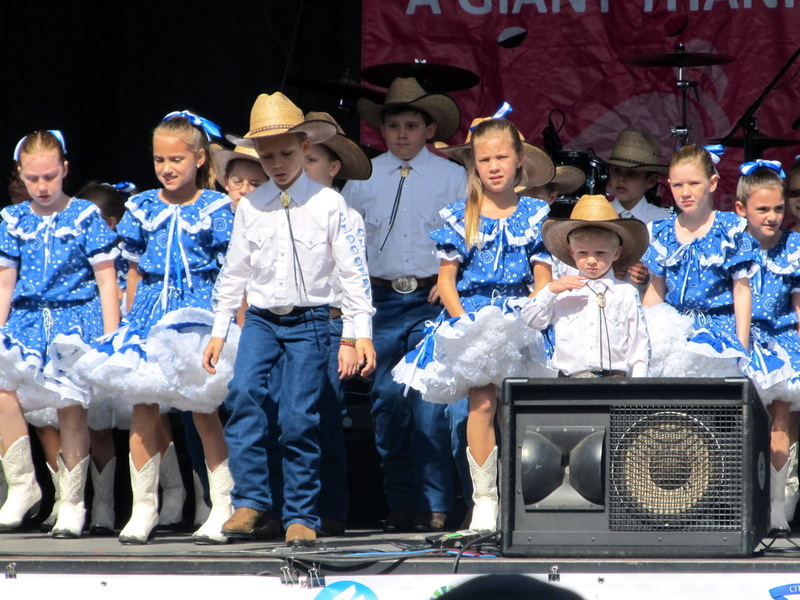 Every week, the businesses had a different day to honor the Midwest visitors. Apparently, the east coast of Florida attracts visitors and snowbirds from the east coast states and this started decades earlier when the railroad connected these two geographic areas. The west coast of Florida attracts people from the Midwest and this was evident from the license plates and the conversations we had. We opted to get a rental car from Enterprise to see some sights more quickly or that were more accessible by car than by boat and also to do several errands. We had two hours to kill before the pickup at the marina. 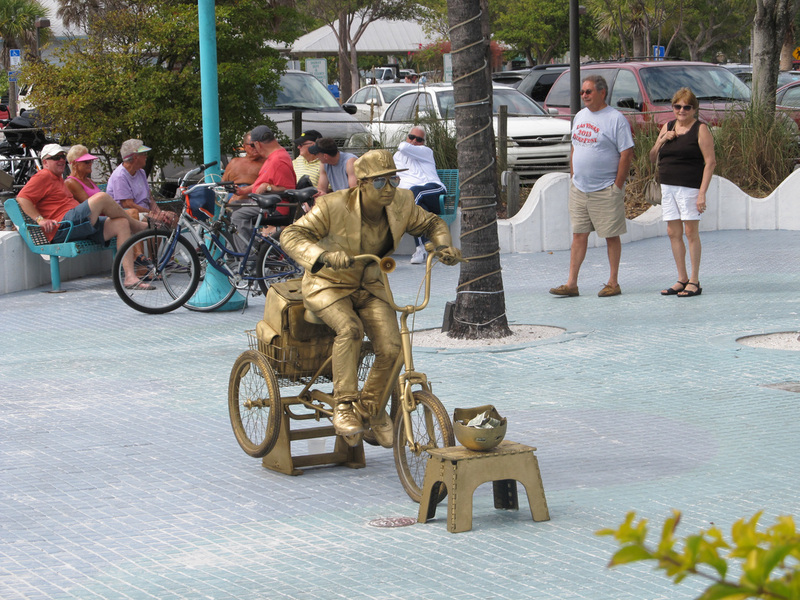 So, we walked and then took the trolley across the bridge and into Times Square onto the island of Fort Meyers Beach. The crawl of cars to cross the bridge foretold the parking nightmare at the beach, which did not prepare us for the mass of humanity laid out on the beach under multi-colored umbrellas, all working on their case of skin cancer. A dermatologist in a mobile clinic would make a killing. This was February, not July. There were thousands, mostly of the same race, white, mostly over 40 but the younger ones really stood out. It is amazing what women will wear and call it a bathing suit and whole necks on elderly men were tweaked and stretched as the these women walked by. We walked the mile back to the marina, met up with Rich and Cheryll while waiting for Enterprise to pick us up. After getting the Dodge Avenger, we headed through another cultural wasteland of strip malls, boarded up buildings and empty shopping centers to find a grocery store, a hardware store, a Harbor Freight store and Laurie’s quest for cooler clothes. The sunset had just set when we got back and met up with Rich and Cheryll for dinner. The management of the restaurant was like the management of the marina, an illustration of odd decisions. No pizza because the oven was broken, the fish of the day was gone, and no creamer with coffee because no one every buys it. How about milk? The waitress gave up on making apologies and sent the manager instead but it was all fine; we are on vacation. During dinner, the weather really changed and quickly. Gusts of wind were the precursors to rain squalls and then a thunderstorm. The rain intensified and the noise of it pelting the restaurant's sheet metal roof made conversation difficult. We said our good nights and ran through the downpour to the tug. Then, it was quiet, but warm in the high 60’s and humid. We were glad of being securely tied to a floating dock. During the night, the howling wind and periods of intense rain woke us up several times. At daybreak, the rain has gone and the wind was a constant 20 MPH plus with higher gusts. 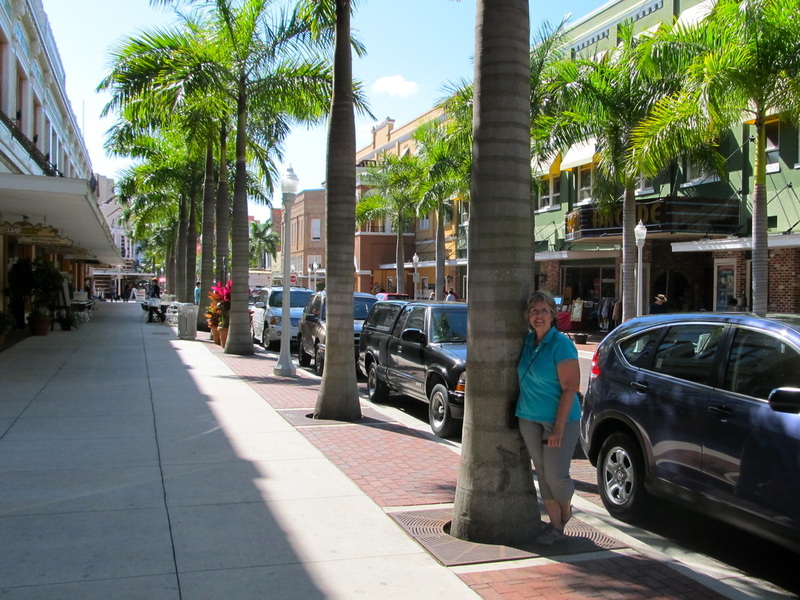 The rental car took us to down the Fort Meyers Beach, past the tourist shops on the north end to the residential district of nice homes, which transitioned into the high-rise condos, resorts, golf courses and gated communities. At the Big Carlos Pass Bridge, the Lover’s Key State Park started and we turned around at the boat launch. The traffic was building and the sidewalks and shoulders were full of joggers, walkers and cyclists. We drove over the Sanibel Causeway that spans San Carlos Bay and connects Sanibel Island to the Fort Meyers area. 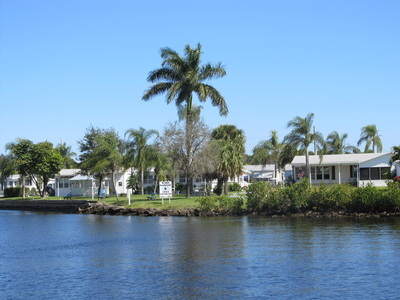 Sanibel is a high-end planned community where the state charges $6 at their tollbooth to cross the bridge and the welcome sign says, “Welcome to Our Community.” An interesting phrase that literally separates the residents from the visitors. 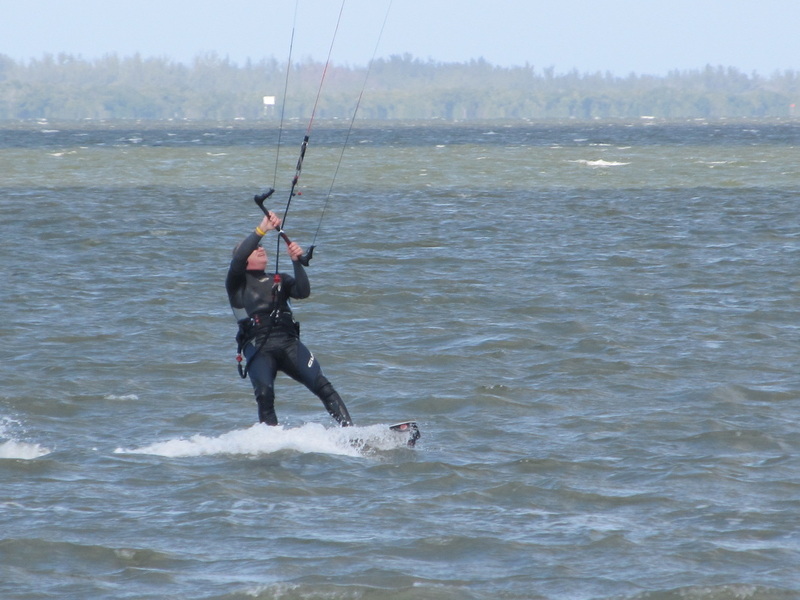 The first stop was the show put on by the kite-boarders and wind surfers who were using the small island in the middle of the span as a take-off platform. 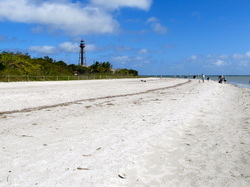 The next stop was the lighthouse park and the associated beach that is billed as the best shell beach in this part of Florida. 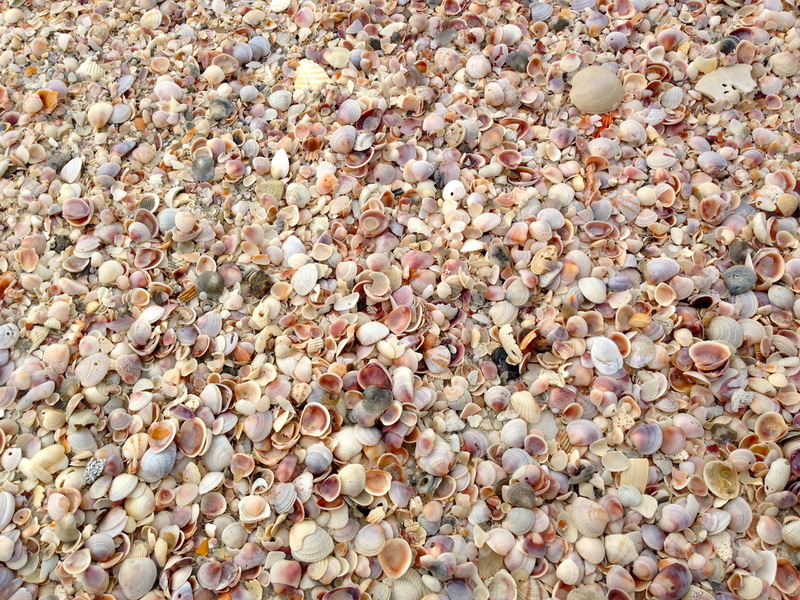 Laurie was in her element, searching and prodding the rows of shells that the tide had created. 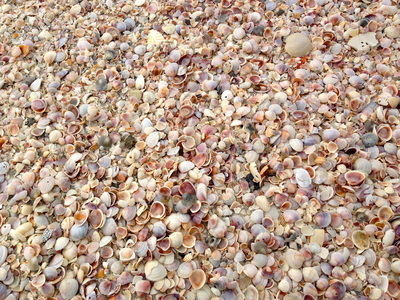 The beach was flush with beachcombers with their small sacks of shells. 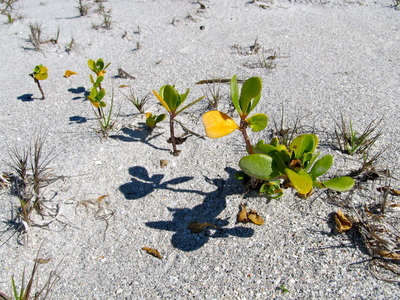 We covered about a ½ mile of beach before turning around. This was not a walk or even a browse as Laurie would walk 5 steps and then bend at the waist and made sounds of excitement and wonder about the latest find. At the cocktail hour, Rich and Cheryll and Mike and Jess came over as we had the biggest boat. More stories, some exaggerations, more information shared and more laughter over wine, beer and light snacks. 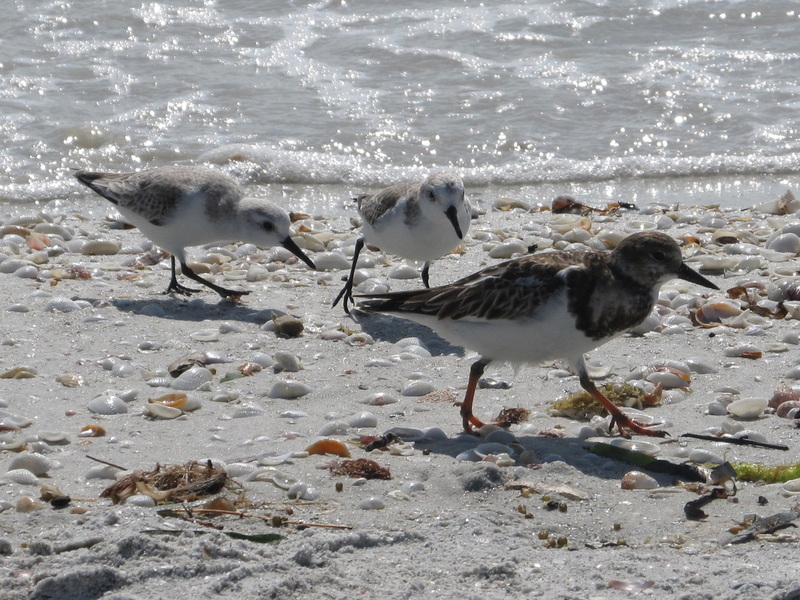 They are heading south to the Keys and we are heading east, across the state, and may see them this summer in Canada. After the good-byes were said, we had a cup of soup to top off the evening. 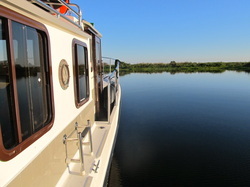 The morning was cool, clear skies, and winds were light that allowed the water to lay down flat. Laurie baked cinnamon rolls in the oven for breakfast. Rich and Cheryll’s Roam and Mike and Jess’s Illusions followed us out of the harbor and they turned south toward Florida's tip as we turned north to head to the Okeechobee Waterway. 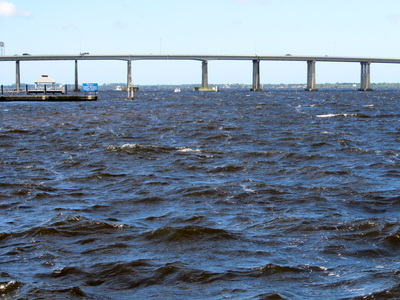 We enjoyed a following sea and cooperative winds as the Okeechobee Waterway was formally started after proceeding under the Sanibel Causeway and started up the Caloosahatchee River toward Fort Meyers. 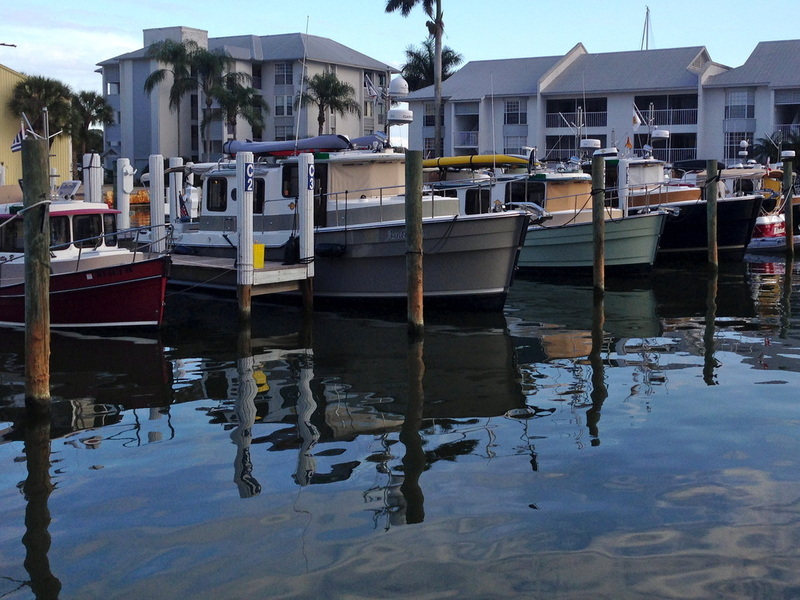 The destination was 25 miles away and the Fort Myers Municipal Marina. The route had many curves, parts were narrow between shoals, and the speed limit ranged from idle speed, to slow speed with minimum wake, to 25 MPH. 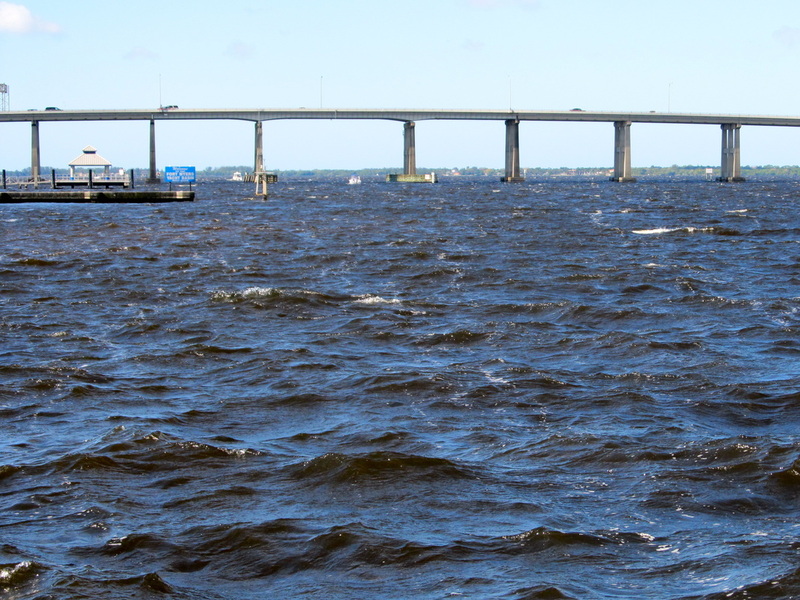 During one of the “Slow Speeds-Manatee Zone” we saw a manatee surface just off of the bow. One of contradictions is the “Slow Speed-Manatee Zone, Except for the ICW Channel.” This effectively means that boats rule in the channel, but everywhere else, manatees are a priority. The boat traffic notched up on this trip and the vessels were bigger and faster. Andiamo experienced the biggest wake so far, at least 4 foot high, by a 36 foot, with wide beam craft that was going 12 knots and turned toward us during the passing that narrowed the gap to about 100 feet. Three hours and 6 gallons of diesel later, we arrived at the east basin of the marina and were directed to a back-in, starboard tie at the dock against the seawall that abutted against the sidewalk. We had doubts about this location because of the proximity to the public sidewalk and no security but the vibe was good, pump-outs and Wi-fi are included and we got a BoatUS discount. Nice and helpful staff told us about the event of the season that was tomorrow: The Edison Festival of Light Parade. 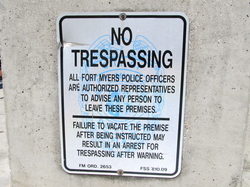 Fort Myers, 65,000 population, was founded when the original fort on the coast was wiped out in a storm and was named after army Lt. Myers. Like so many names in history, a bureaucrat changed the spelling. The old downtown has been revitalized and is coming back to life. The commercial core, the jobs, and the government offices are all somewhere else. 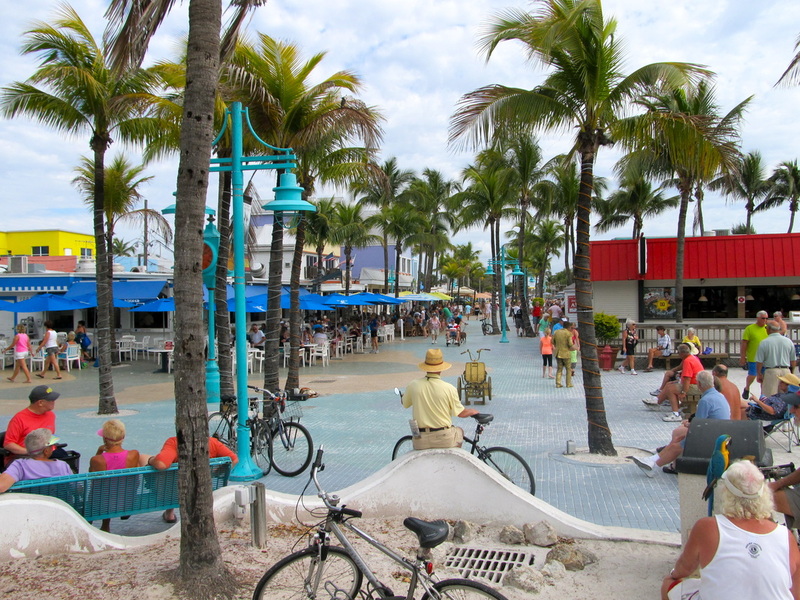 On our walks, the number of lawyer’s and CPA offices were too many to count but the number of outdoor restaurants, wide sidewalks, palm trees everywhere spoke of the new infrastructure made this all inviting. 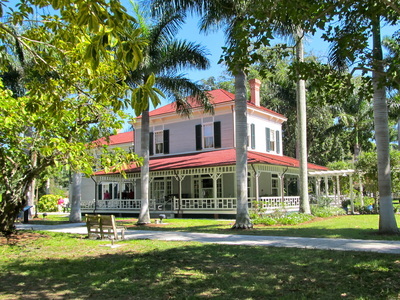 Under sunny skies, temperatures in the 70’s and a comfortable breeze, we walked to the Edison-Ford Winter estates where the afternoon was spent experiencing these two winter homes and learned that Henry and Thomas were buddies and spent many winters as neighbors. 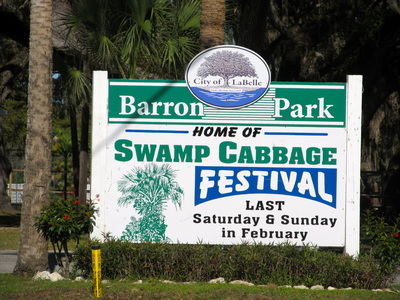 The admission price was $20 each and the grounds, exhibits and story was worth it. Walked back, stopped at the Publix store, had French pastries and iced decaf coffee at a cute, sole proprietorship store that was next to the Starbucks. Watched a chef from a nearby restaurant pick desserts for that evening’s meal. A pickup stopped in the no parking zone and like a swift and quiet drug deal, the woman driver delivered a huge tray of pastries and left. For Valentine’s Day, we grilled steaks and had our favorite zinfandel with fresh baked brownies from the oven that were topped with homemade raspberry jam which were enjoyed while streaming off the great Wi-Fi the episode of Downton Abbey that we missed. On Saturday, we started with some boat maintenance, pumped out the holding tank because we could and filled the water tank. Adjusted the hot water heater’s thermostat to be a bit hotter after reading online about how to do that from the manufacturer of the mixing valve. Chatted with a craftsman who was working on the shell of hull that looked like a sailboat without a mast but was really a slow speed trawler. He lives aboard a 26 foot sailboat in the marina with his wife and two small children, works on boats during the 5 months of the winter and works the oil fields in North Dakota during the rest. 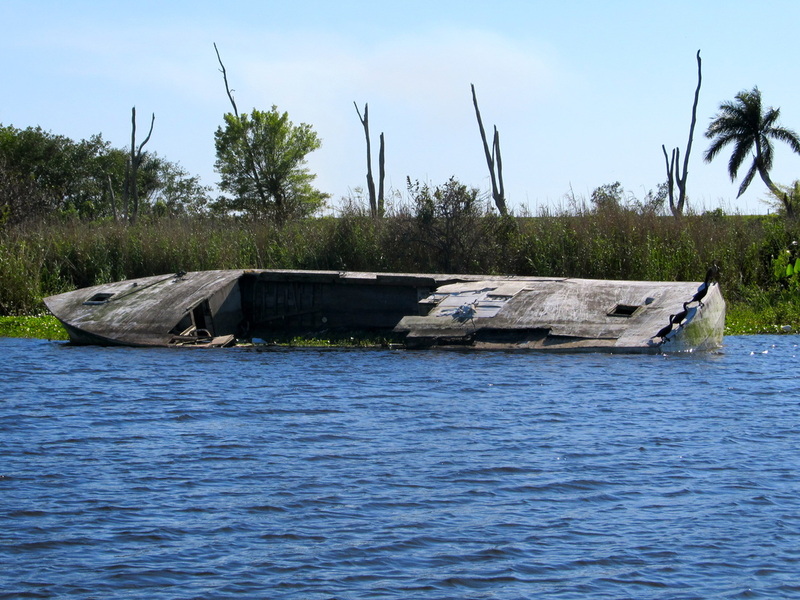 The owners of this 1974 hull had everything stripped out and would likely put $40K into the retrofit. The Sailflow app on the iPhone predicted sustained winds on Saturday of nearly 20 with gusts to 30. 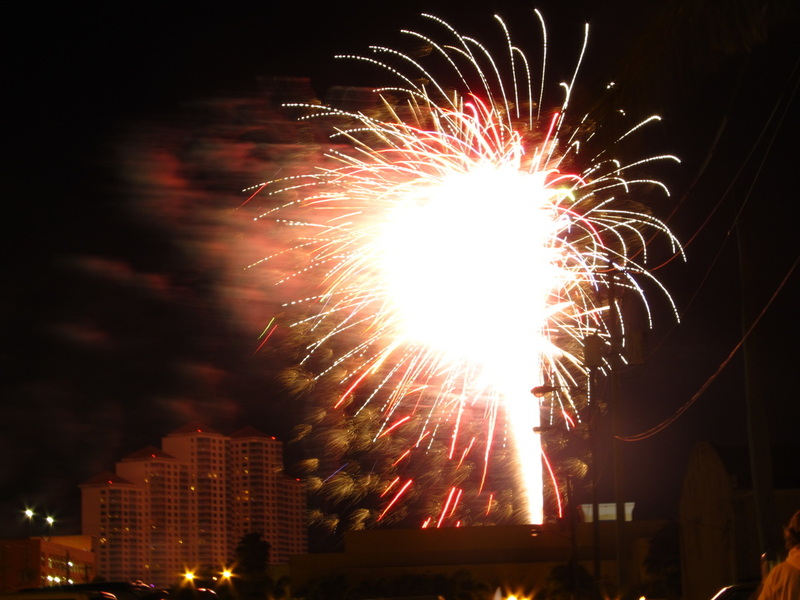 It was good to stay in Fort Myers another day and experience the lighted prarade. Andiamo had special protection. Not because the police and fire boats were in front of us, because we were in the lee of the Florida Wildlife Commission’s Department of Law Enforcement station, and the winds were a fraction of that elsewhere in the marina. Walked the docks in both basins and did not see any boat that called us. There are more catamarans, more go-fast yachts with sundecks that Brad accurately calls, “widowmakers” because the deckhand stands on the swimstep for docking, cannot be seen by the captain and something bad would happen and be undetected. Explored the downtown area and after lunch, research was done for the coming week of travel on the 135 mile long Okeechobee Waterway that cuts across the state to Stuart. The owner’s manual for the VHF radio was reviewed again and settings were made as we were going to use it more to talk to bridges, locks and commercial boat traffic. 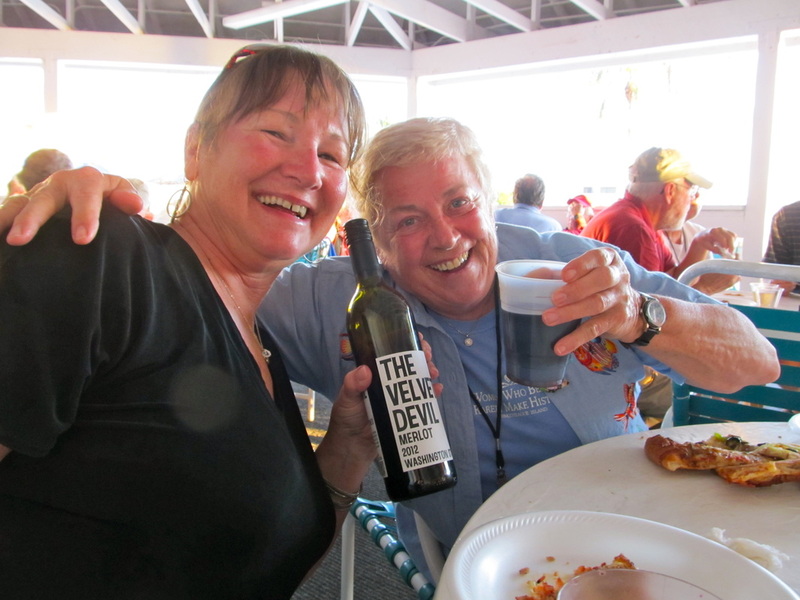 After trying to get into three restaurants for an early dinner, we opted for our wine and a light taco salad on the boat and with the sun going down, we followed the masses to the parade route. The parade was huge, starting with fireworks, had a dozen marching bands, at least 50 floats, and lasted 90 minutes. We sat on the curb in our deck chairs with the locals and loved it. 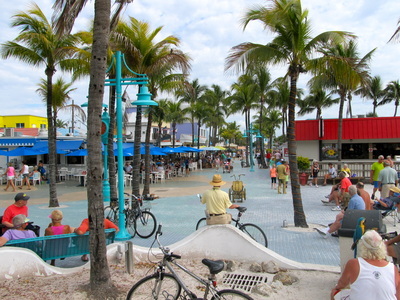 Most of the people doing the Great Loop will go to the Florida Keys and spend a month, mostly at Marathon, and explore the Everglades before going north through the Miami-Fort Lauderdale metro area that dominates much of southeastern Florida. We had done four trips to that area to drive, explore and scuba dive. So, we opted to go across the state of Florida, from west to east on the Okeechobee Waterway which is a number of rivers, canals and of course the hugh lake in the center of the state, Lake Okeechobee. 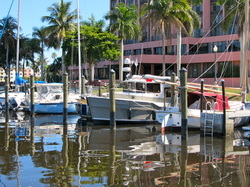 The waterway begins at Fort Myers on the Gulf of Mexico and ends at Stuart, near the Atlantic. It was cooler night than we had anticipated and the inside of the boat was 58 degrees. I confess, we turned on the fabulous Webesto diesel heater and quickly brought the cabin up to a comfortable level. With the winds light and the skies clear, Andiamo idled out of the Fort Meyers Municipal Marina and headed east, up the Caloosahatchee River and quickly left the last of “condo cruising” that had dominated this area. 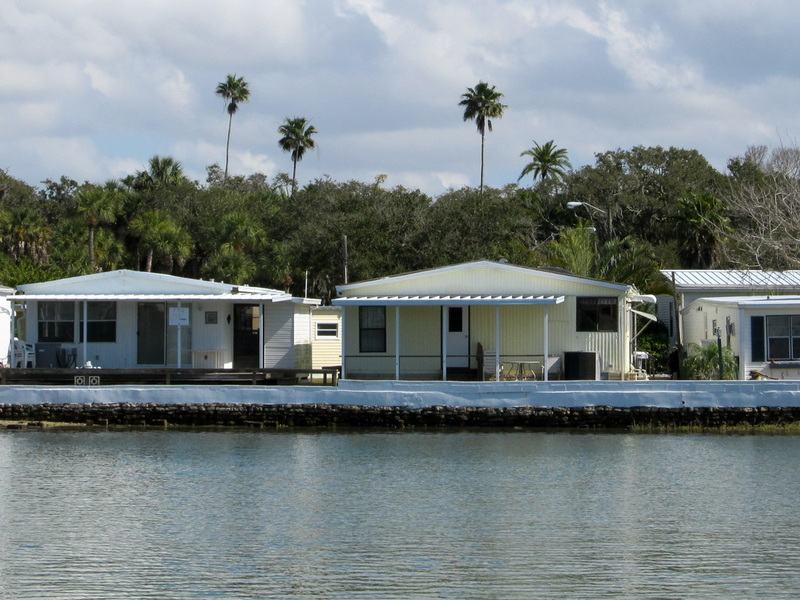 We were heading into an agricultural economy that was interrupted with mobile home retirement communities, a yacht and racquet club, a power plant, and a few moderate and expensive homes. 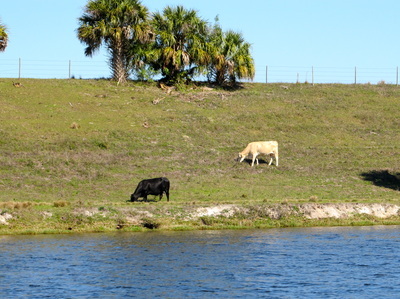 Cows were grazing in the fields that come to the shore. Groves of palm trees were thick. 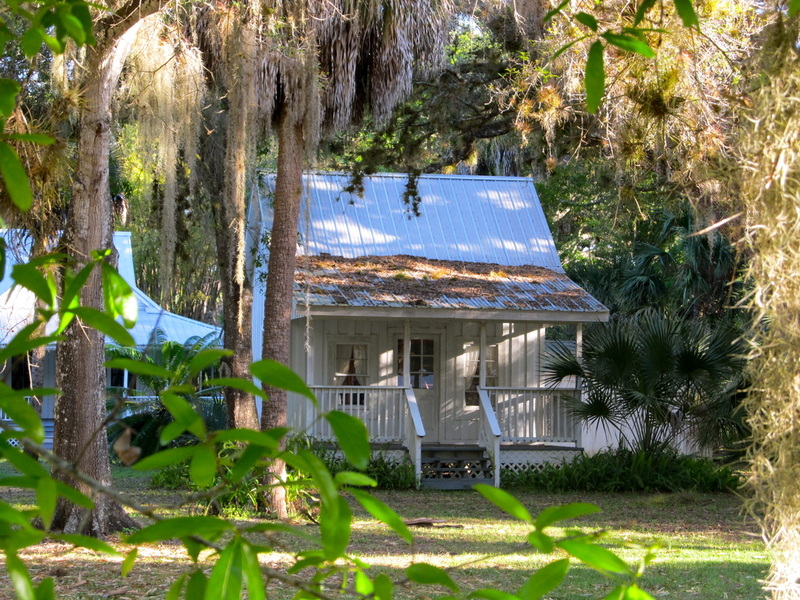 For sale signs were frequent, from the home on the riverfront to 1,500 acres of raw land. We were enthralled with the change of scenery and did not use the opportunity to go the fast cruising speed. Instead, we stayed at our slow cruising speed and did the active steering, going under bridges, and we went through our first lock in Florida, the Franklin Lock, about 14 miles into the trip. 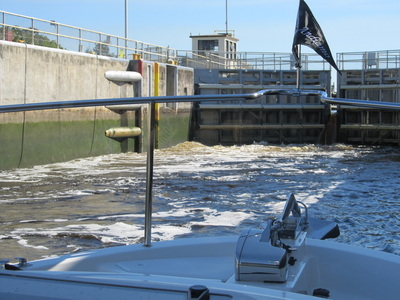 The lockmaster came right back to Laurie’s voice on the VHF radio, turned the lock around which meant he closed the other doors, lowered the water level and let us in. We idled in as the only boat there and the first boat on his shift. He threw us a stern and bow line which we put through the cleats and held onto with gloved hands. Letting the engine idle, the doors of the upstream cracked opened and the water poured in to raise us by three feet. The very little bit of turbulence was easily handled. After the lock, we checked out the nearby Corps of Engineers campground and docks. There was one slip available but opted to not stop and kept going eastward. The river may look straight on a map but it is curving and turning making every bend a new surprise. 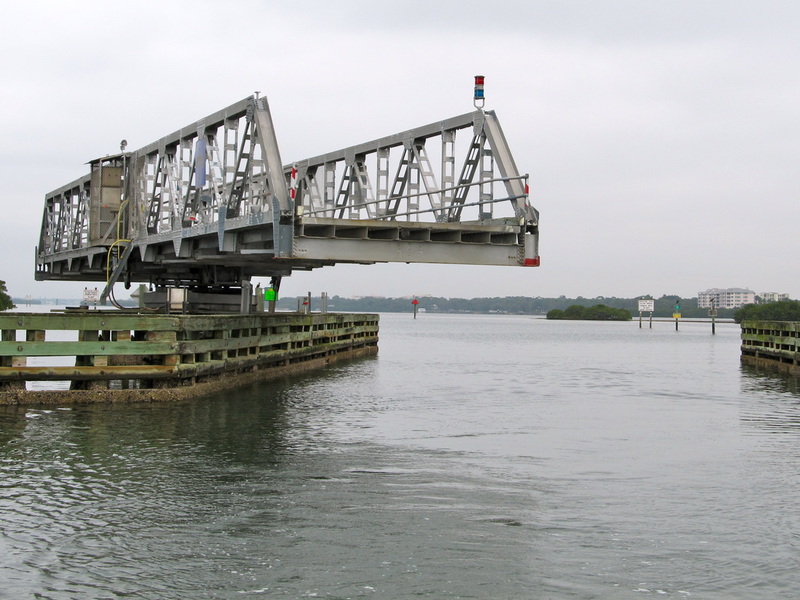 Laurie called the bridge tender at the Denaud Swing Bridge for an opening. We saw an older man, bigger and older than us, walk slowly toward the middle of the bridge after closing the highway gates. Then, he climbed into a small cage, pulled some levers and the bridge slowed rotated and cleared the river to allow us through. 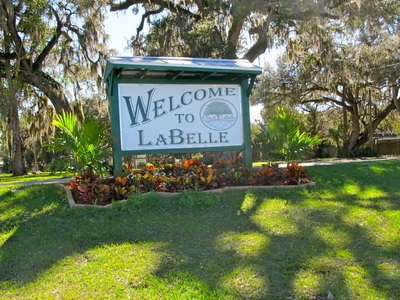 Five miles later, we arrived at our destination of LaBelle and its small city-owned dock near the highway bridge. This new fixed dock and pilings could hold 7 boats and there was room for us. The dock is free, as is the power and water. 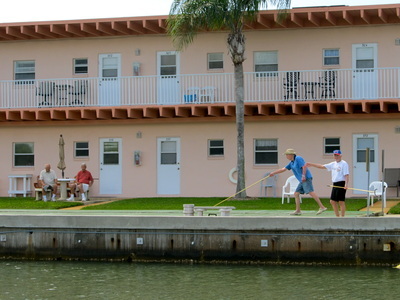 Boaters can stay for three days. This is an apparent incentive to spend time in this town of 2,000 that is the county seat of Hendry County. We had traveled 42 miles and the cruising was easy in this boat. 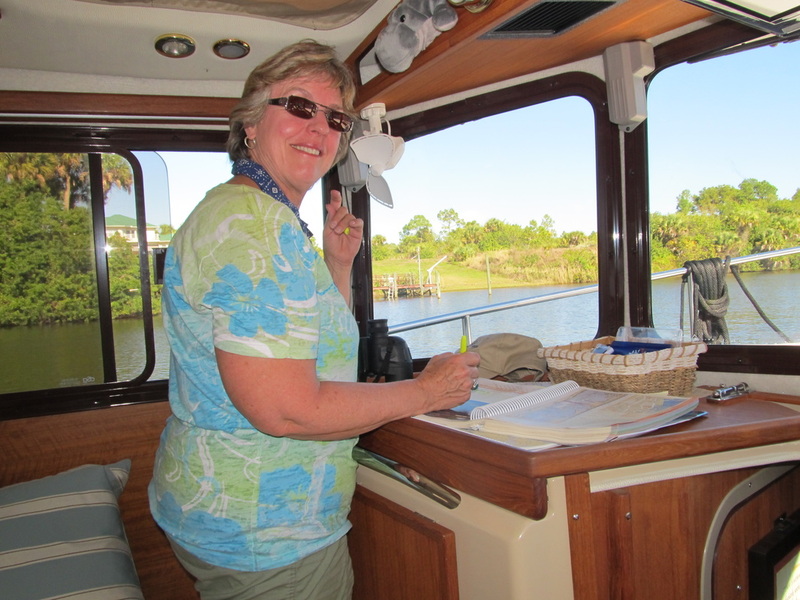 We first met Nancy who lives on the Chesapeake, as she helped us with our lines. 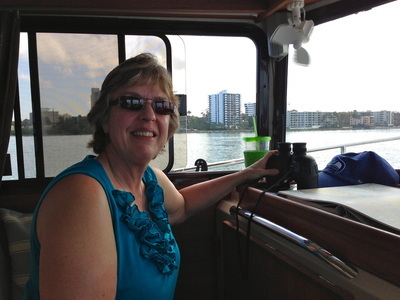 She is a longtime cruiser and encouraged us to take the rim route around the south part of Lake Okeechobee. 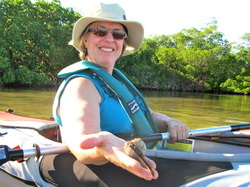 After exchanging boater cards, she offered her dock on the east shore of the Chesapeake if we go to her community. Also at the dock was a couple who had been living on their Island Packet sailboat for 7 years. LaBelle was a big stop for them as they were repairing canvas, doing heavy duty cleaning and were re-provisioning. When full-time liveaboards have no apparent money-producing work, free moorage, power and water is a big deal. With Andiamo appropriately tethered between the two pilings and her stern cross-tied to the dock, the store was the destination. Walking down Main Street on a Sunday is not a fair representation of anyplace as it was quiet and every business except fast food was closed. Little in this part of LaBelle is new but it is also not broken or neglected. We found the Save A Lot grocery store with the help of the iPhone, which has become a tool that we use a lot, from asking Siri what the population is to finding the services we are looking for. This grocery store is purely for the working people. In the parking lot were old school buses that had just off-loaded workers from the agricultural fields. We were probably the only Caucasians and Spanish was the dominant language. However, we did not feel uncomfortable or unwelcome. Being a visitor, a guest or a traveler is about showing respect and being courteous and from that doors are often opened. Walked back to the tug using another route through an old residential area where many homes were gone and raw property was left, another sign that the economy here has not peaked. Brauts were BBQ’d in the cockpit after a shower. Then brownies and tea were served while we watched 60 Minutes and later Downton Abbey on Andiamo’s TV system. 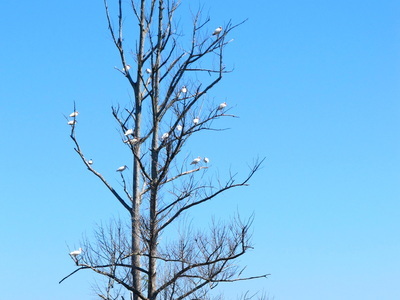 This was a cloudless sky, light dew and morning temperature of 58 degrees that would later rise by nearly 30 degrees. 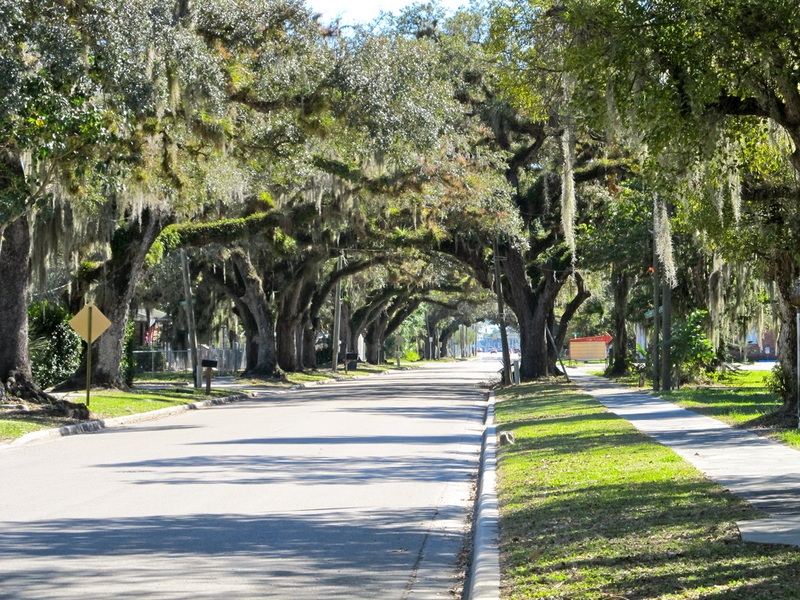 After breakfast, we walked the residential streets round LaBelle’s elementary school and got a taste of “old Florida” with huge trees that provided the Spanish Moss a place to flourish. 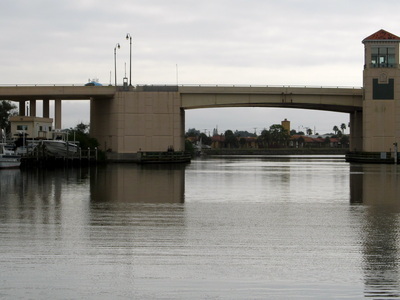 We pulled away from the city dock at 9AM, headed under the highway bridge that some boats needed opening, and passed by the large Port of LaBelle marina that had a vast number of empty slips. This was high season on the coast but that wave had not arrived here yet. With the last edges of the small town in our wake, the countryside reverted to its historical roots of agriculture and ranching. 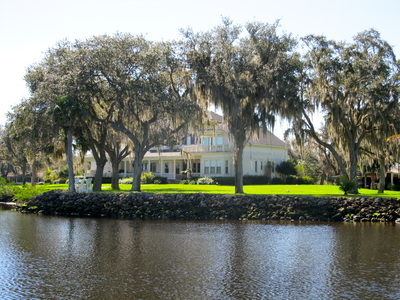 There were pockets of boat/home developments where the marsh or swamp had been cut with canals, the land drained and raised, then dotted with homes and docks. These were not new or high-end but most were well cared for and one canal had out-of-place sailboats and even a Nordhavn 40-47 footer tucked under the trees. When the river became a ditch and engineer-certified straight, that probably connected two smaller rivers and was dredged to a depth of 13 feet with the spoils piled high on both sides that severely restricted the view, the tug was powered up to 18 MPH all the way to the Ortona Lock and Dam. Now locking veterans, we eased in, each of us grabbed a hanging line that was put around a cleat and the surging water pouring through the slit the open gate lifted us 3 feet. The mastery of the lockmaster’s skills was evident in his manipulation of the gates. The torrent of water and its force was directed to the other side of the lock, missing the tug completely. Having AIS (automated identification system) gave us a preview of a fast on-coming fishing boat behind us. Andiamo was doing 8 and this offshore sportsfishing boat was doing nearly 30. The captain showed a mastery of skill and courtesy by closely matching our speed as he passed within a boat-length on this narrow channel that caused a very minimal wake. Then he was gone and our AIS system tracked him for about 15 miles. 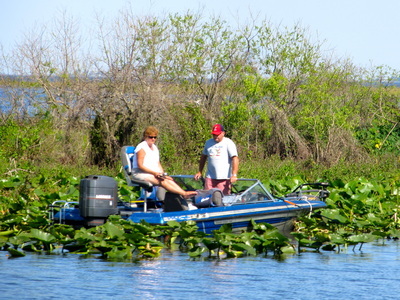 The trip was delightful with temperatures in the low 70’s, light wind, smooth water, and a consistent depth of 15 feet. The town of Moore Haven is nearly at the edge of the Lake Okeechobee but the edge starts a sea of marsh and grass, not navigable water. We looked at the city docks to have lunch at but the spartan look of the area did not call us. Immediately after the docks was the railroad swing bridge that was open, though the opening through it was narrower than any I had ever seen before. 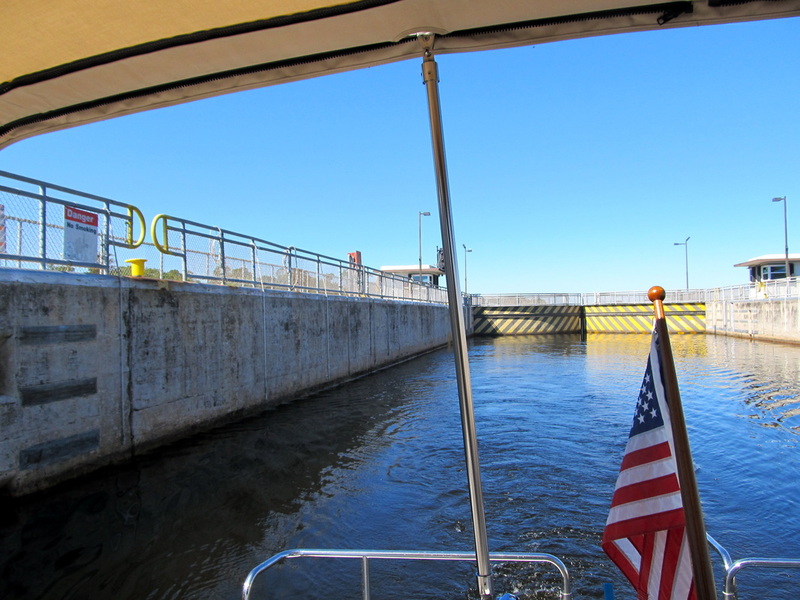 Our final lock of the day was the Moore Haven lock and dam that raised us about 2 feet. 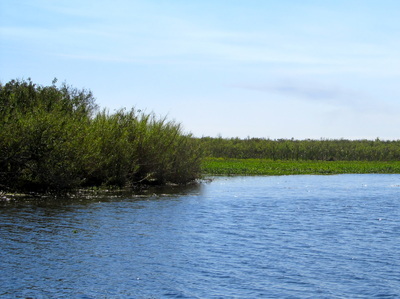 Rather than going straight into the sea of grass and marsh, the dredged canal makes a sharp turn to the south and follows the edge of the lake with a two story high levy built on the inland shore and small islands and marsh as far as the eye can see on the lake side of the waterway. 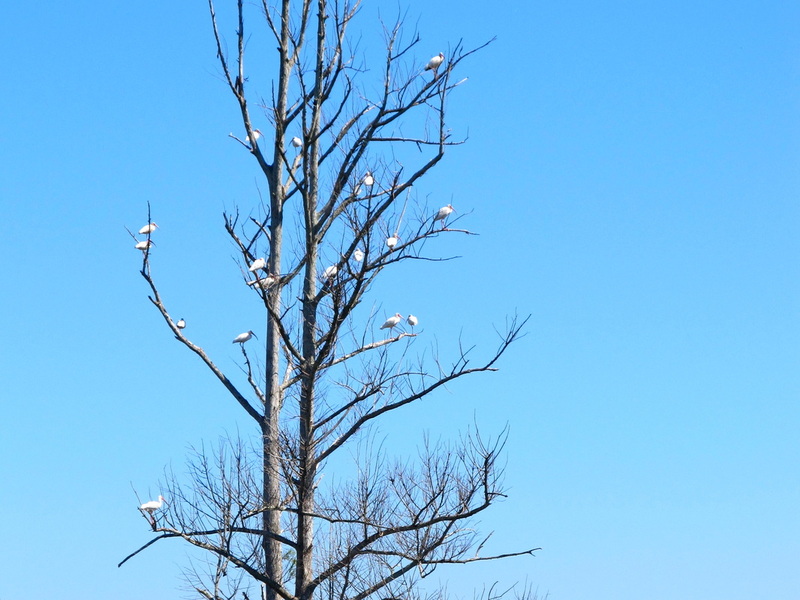 This is major bird-land and Laurie spent all of her time between the binoculars and the two bird books to identify all the variety: egrets, white and blue herons, white ibis, osprey, cormorants, anhingas, turkey vulture, and killdeer. The first access to the navigable lake waters is 13 miles from Moore Haven at the town of Clewiston. It was 2PM and we considered stopping so we idled through the open lock that looked more like a castle’s open gate than a water control strategy. The canal was narrow and had a depth of 5 feet. Behind the levy, the ground opened up and though it was compact for boating, there was ample ground with little on them. The 7,000 people who call Clewiston home lived elsewhere. 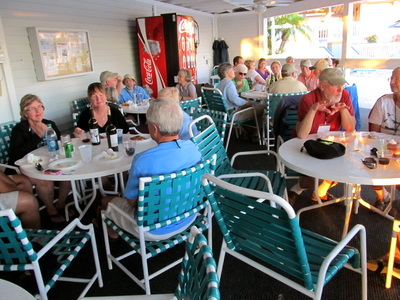 There was ample room at Roland Martin’s Marina that was a full service operation and the outdoor bar and boater’s room was well occupied by the crew of a number of big trawlers. Not feeling it and really wanting to experience the quiet anchorage at the southern tip of the lake, we idled out, turned right outside of the castle walls and headed south. Shortly after leaving Clewiston, we saw our first alligators on this trip that were sunning themselves on the sandy shore. 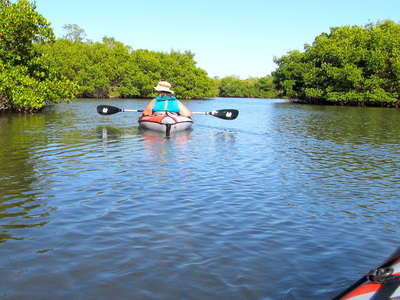 After Andiamo glided by the rental pontoon boats with fisherman, we powered up to 18 MPH for 30 minutes, finished the remainder trip of four miles at our slow speed, efficient and cooling temperature, and arrived at the small kidney shaped bay at 3PM after easily traveling 55 miles. 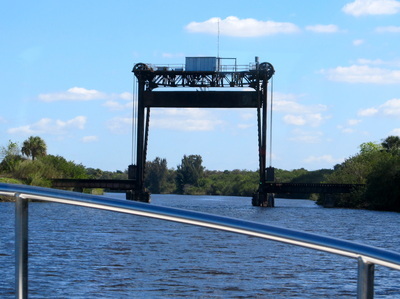 This route is known as the rim route by boaters and Route 2 on the charts. It is the road less traveled rather than the direct, across the lake route, because it is 10 miles longer, and is more prone to shoals when the lake’s water level is down. 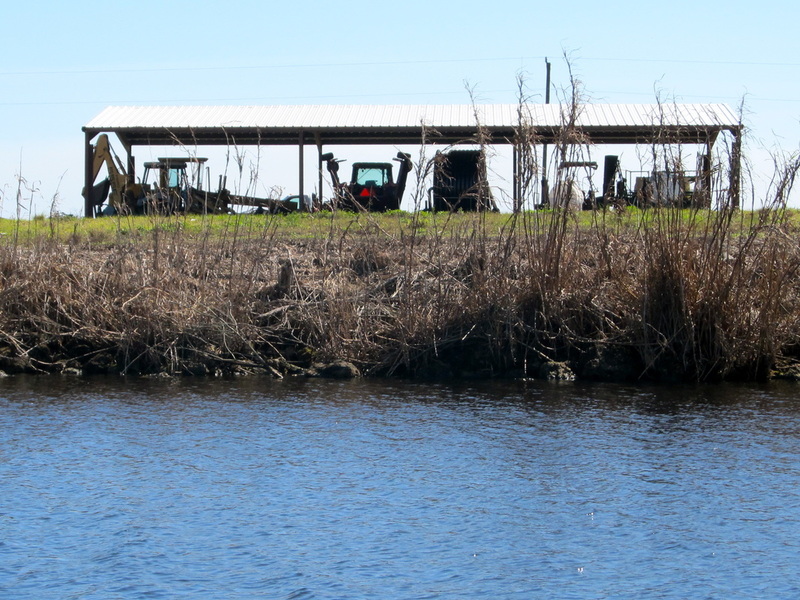 Like most of these waterways, the funding to keep them dredged and open is very limited, if not gone completely. 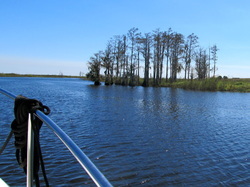 We opted for this route based on three recommendations, Rich had not done it but heard about it, Nancy who just went on it and loved it, and another boater in LaBelle who spoke of seeing birds and alligators. Also, the lake level was up. We dropped the Ultra anchor in 15 feet of water and set up shade and heat control as the temperature rose to 87 degrees. 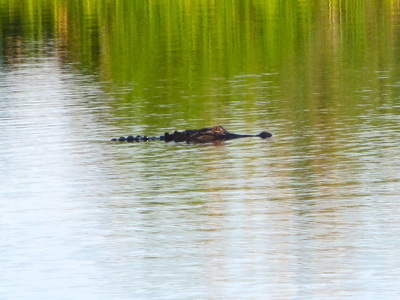 Bass fisherman from the nearby boat launch worked the edges and Laurie spotted the 8-foot long alligator while preparing the dinner of shrimp. What she thought were bugs landing on her, was ash from a distant burning field. 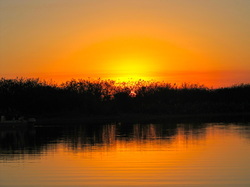 After the sunset, we used the tug’s searchlight to look for alligator eyes but did not find any. Then came the freshwater night bugs, the very smallest ones could penetrate the screens and they were not the biting kind, they just hugged the light. Turning on the deck lights attracted the bigger ones and there were swarms. Still, the night was comfortable with playing cards, hearing the distant freight trains, the full moon and the blaze of stars. The brilliant sunrise was augmented by the sound of the crop dusting plane making their turns over the lake. All of the small flying bugs that were in the cabin had expired, spending their last hours trapped in a great boat. The cleanup job was easy with a swiffer sheet. The rest of the bug bodies on the cabin were gone when the dew dried up and the breeze blew them off. The anchor came up easily at 9AM and we did a low speed, short run to the swing bridge at Torrey Island that is next Slim Picken’s RV Park and Marina. 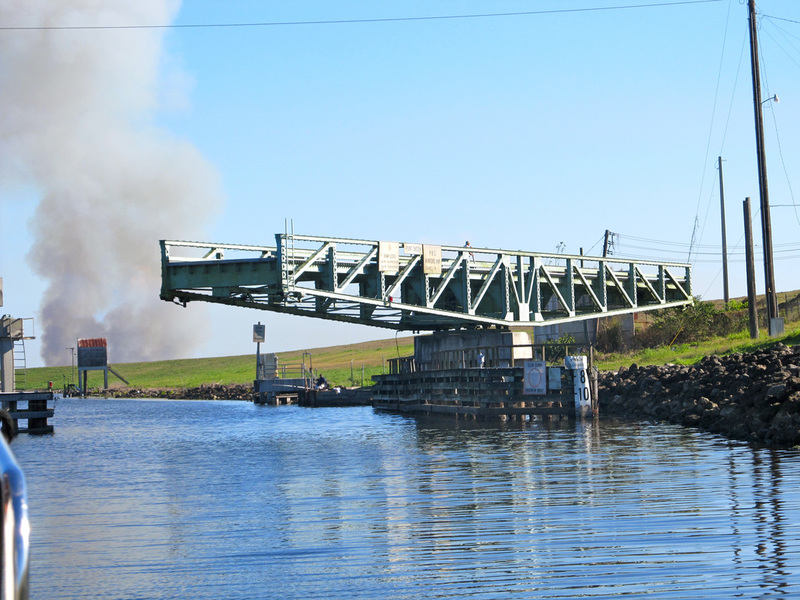 After Laurie contacted the bridge on Channel 9, the voice on the other end said, “I will send someone to open the bridge.” Now, we knew that this bridge is opened by human powered effort. 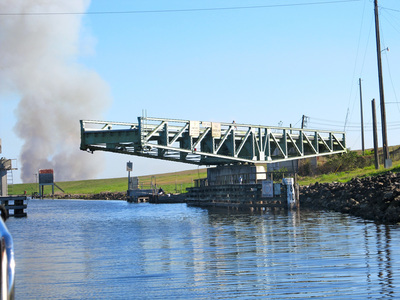 As we approached the bridge, we saw a man hand lower the gates on the road, walked to the center bridge with an 8 foot long pipe, he inserted the pipe into a drum and started walking around the drum and the highway bridge started to swing open. It was very entertaining. For about 5 miles, we were between the high levy that was built in the 1920’s to contain the lake during a hurricane and the marshland. 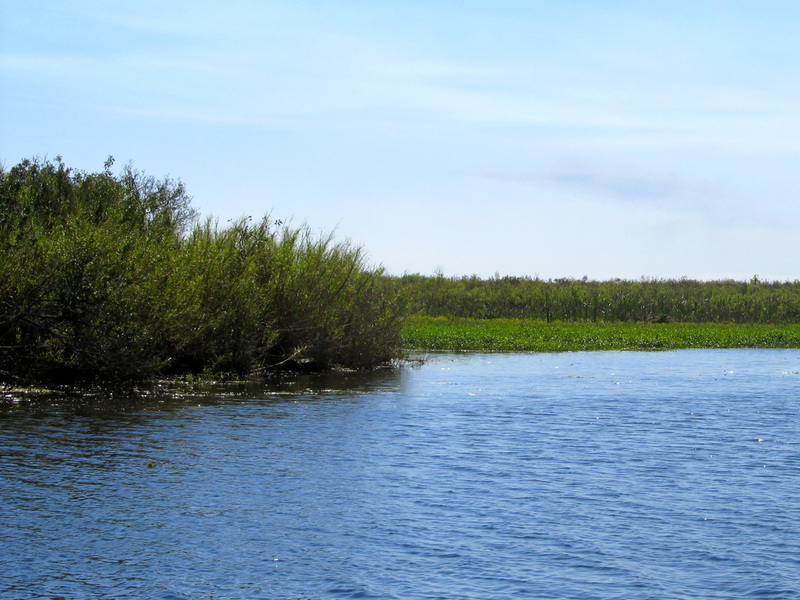 All along this shoreline we passed major construction efforts that are intended to undo some of the unintended consequences of containing Lake Okeechobee with this high levy and the draining of swampland. 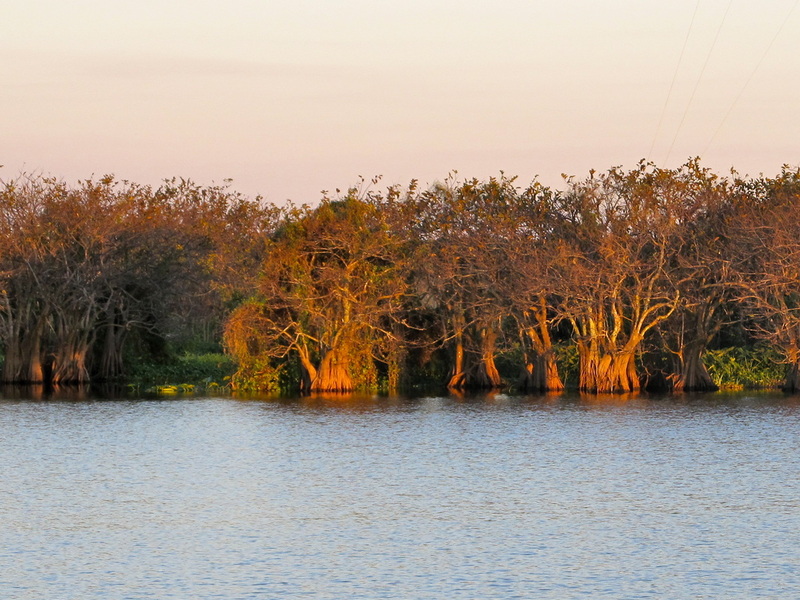 Those consequences included the dramatic shrinking of the Everglades over the past decades. Then, the marshland was gone and the horizon was all water as far as the eye could see. The red and green channel markers kept us off the shoals that hugged the coast and kept us way from rocks. 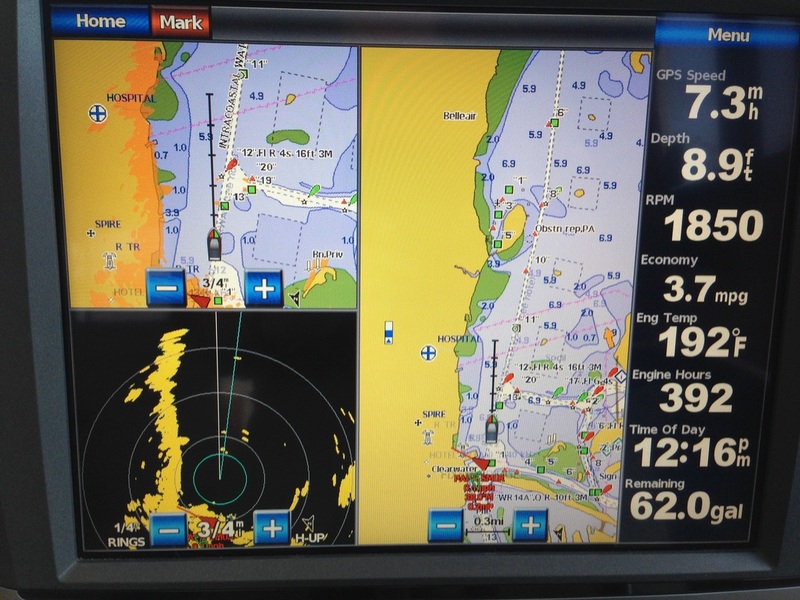 The electronic chart did not exactly match the physical navigation markers as we turned to round each buoy. The chart is only advisory. 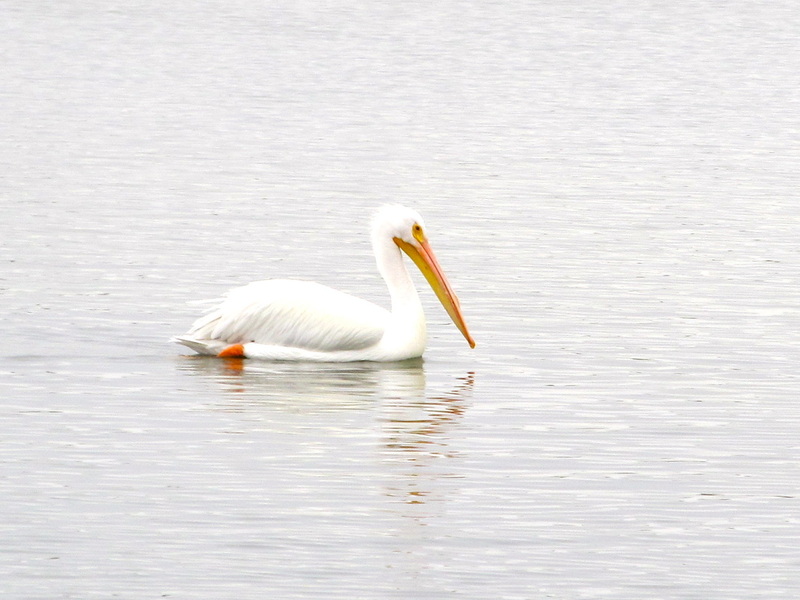 As the protection of the marshland was gone, Andiamo had to contend with the 1-foot chop coming out of the north that had the whole length of the lake to build. 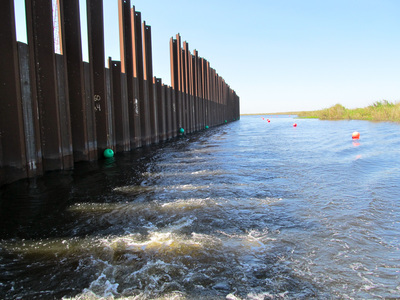 As we neared our destination at Port Mayacka and its lock that would take us off the lake and into the St. Lucia Canal, the water depth lessened from 6 feet to 3 feet. Listening to the radio traffic on Channel 13 that is used to communicate to the locks, we knew that the lock was basically opened and the lockmaster was directing traffic through the narrow lock and keep one set of doors closed to protect the channel from the lake’s wave action. 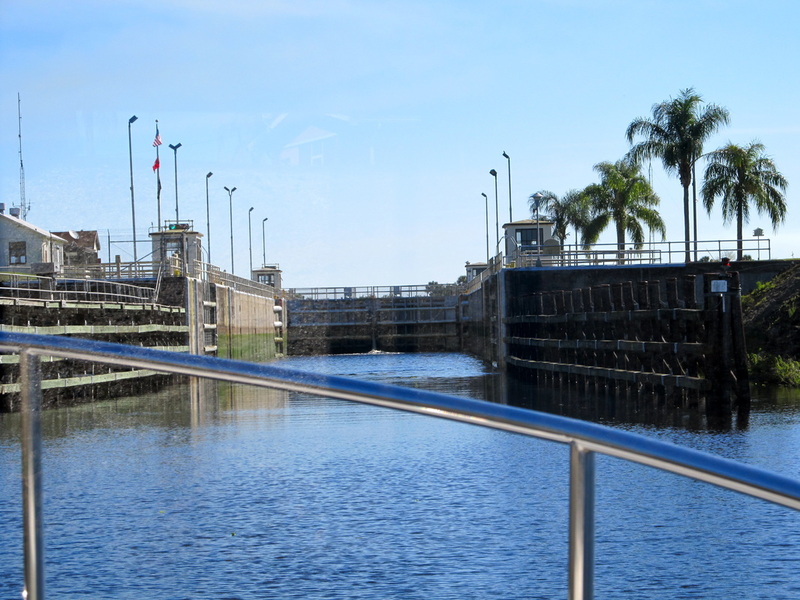 Through the lock and idling through the narrow span of the open railroad bridge, the St. Lucie Canal is the eastern link of the Okeechobee Waterway from the lake to the Port of St. Lucie. The canal is narrow but perfectly adequate for two-way traffic as long as the boats drop their speed during the pass. However, the boat traffic was extremely light. 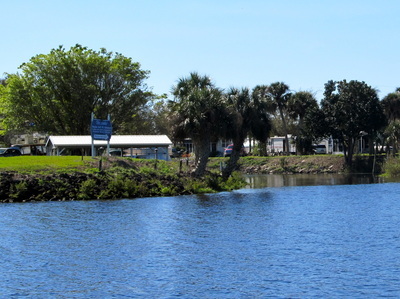 Highway traffic could be heard over the pine trees as we slowly cruised our way to our destination at Indiantown Marina. We called ahead an hour before our arrival and learned again that a tug our sized can often fit anywhere and can get in to places on very short notice. 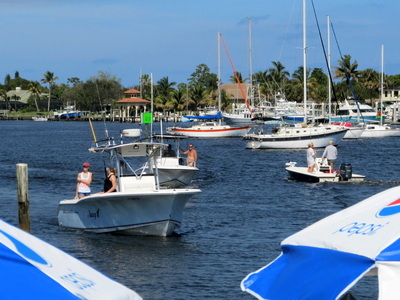 We turned left into the small bay, off the canal, and encountered the compact marina at 2PM. 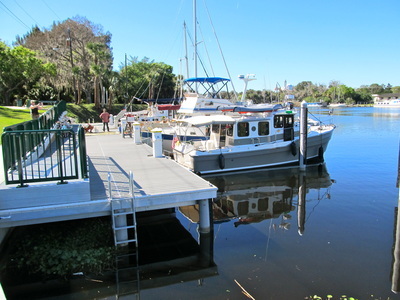 Transient moorage is immediate on the front docks as we side-tied. The weekly and monthly users of the marina had better protection for the wakes coming off the canal. 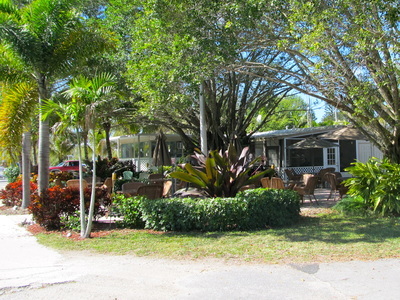 The grounds are well maintained, the store is well stocked and the boater’s lounge looked like a resort in the Caribbean. After hooking up and paying the bill of $1 per foot plus $6 for power, we had a light lunch and walked the sprawling grounds where boats were in storage or being worked on in a large yard. The boats in storage were in wide spectrum of condition; the badly neglected to the almost new and some still had hurricane straps to bind them to the ground. The town is a mile from the marina, so we spent the afternoon just relaxing, catching up on communication and getting the laundry done. 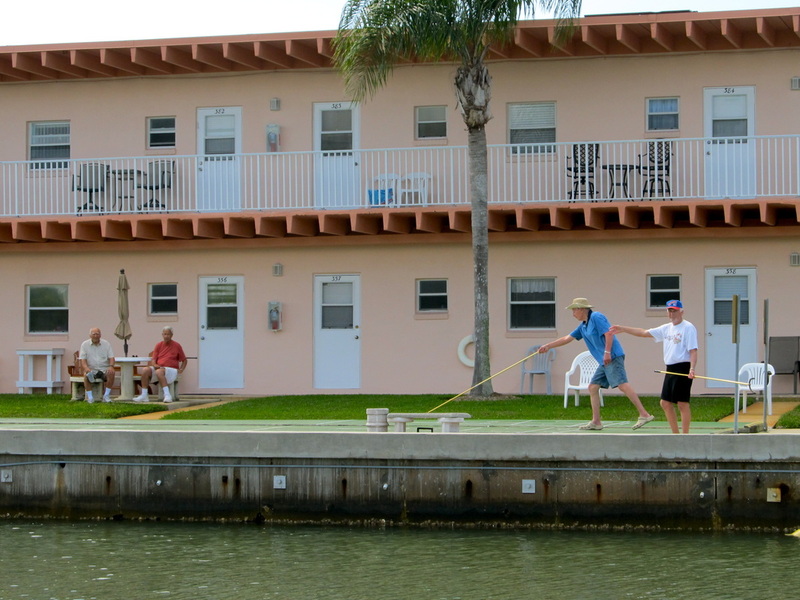 We left just after our neighbor, a big twin-screw sportsfishing boat with a new owner and his three buddies as crew. They had come Palm Beach and were sprinting to Panama City that is way up in the panhandle. Each had a large cooler packed with water bottles and their favorite pop on ice. He was new to this size of boat and needed the advice and assistance of the marina’s owner to get the boat docked. With the noise and smoke of twin diesels gone and while we made our preparations, Laurie saw the 12 inch long green turtle just off the bow. 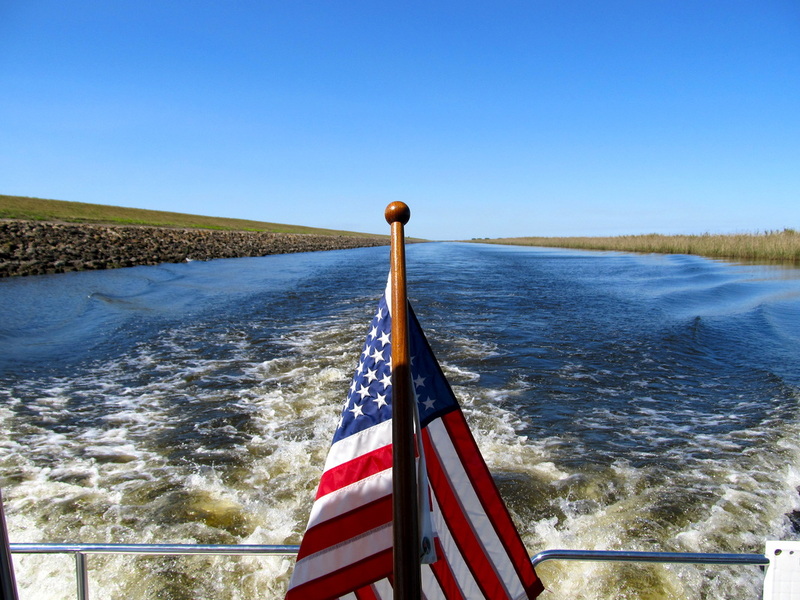 We idled out into the quiet canal under sunny blue skies with the temperature in the low 70’s and climbing. The canal was an arrow straight ditch with a uniform width and depth. 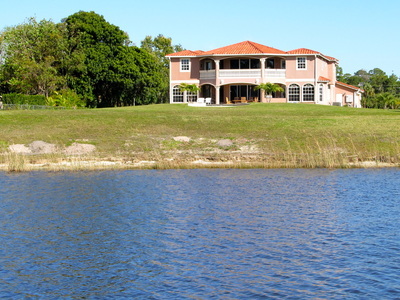 The mature vegetation and the occasional house made the canal interesting. Far off in the distance was a big yacht and we closed the distance when we powered up to 16 MPH and ran for 40 minutes. 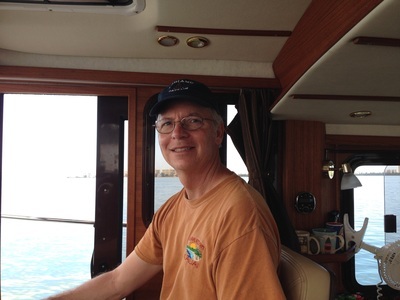 Three miles from the St.Lucie Lock, Andiamo matched the speed of “Captain Ron” a 40 foot Nordhavn that was registered in Minnesota and we eventually follow it into Stuart. At the lock’s entrance 18 college students in racing kayaks and part of class suddenly appeared and would play havoc with all the boats entering and leaving the lock. They were doing workouts and trios were racing each other. They had decided that the boats needed to yield to them and would dart out in front and force boats to turn wide. The lockmaster told all the ships via the radio to just sound your horn at them and that should move them. That was wishful thinking. We were the third boat in the lock with a sailboat “Lotus” in front that was being single-handed. “Captain Ron” was in front of us. “Lotus” needed extra help from the lock staff to get it secured to the wall and to keep the boat stable as the water dropped 13 feet. This lock, you grabbed the lines hung by the staff and let the line out as the boat dropped. The Ranger 29 is as easy to control as the Ranger 25 and the sliding door makes it one step more convenient for the skipper to control the forward line. After the lock, we were back to high-end estate cruising as the South Fork of the St. Lucie River twisted and turned its way to the Atlantic Ocean. We passed “Lotus” and he continued to follow our path. Then, the water opened up into a wide expanse but the navigable channel was narrow requiring close attention to the red and green channel markers. At the junction of the North Fork of the St. Lucie River is a highway bridge that is next to the sprawling Sunset Marina. The bridge tender held the bridge for us as three other boats including the “Captain Ron” were faster to get there. About a mile past the bridge, “Lotus” said he was aground near the bridge in a large shoal that we saw on the chart. From the radio traffic, “Lotus” was reluctant to use a commercial tow that was there because he was afraid his insurance rates would go up. 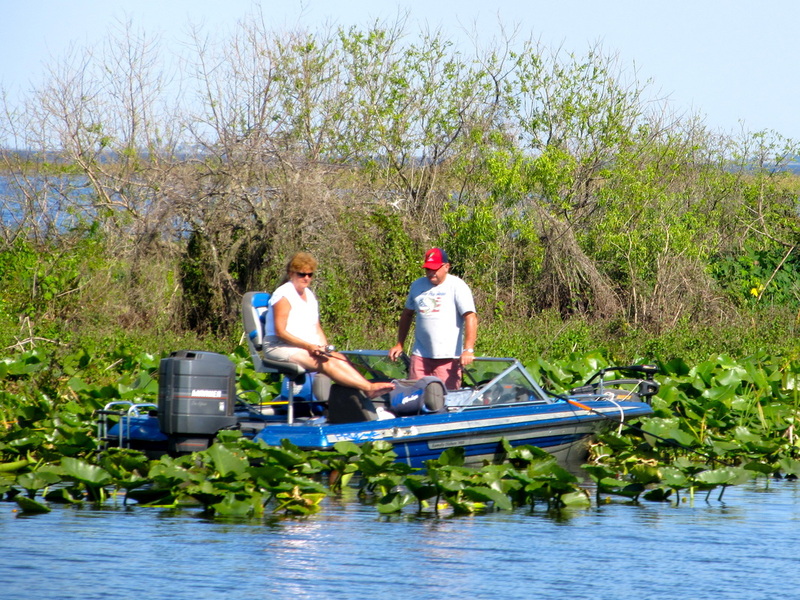 He wanted help from a fellow boater that has a host of other challenges and risks attached. Yesterday, we connected with Tom and Pam who had purchased our Ranger 25 from us last summer and had taken her home to Michigan. 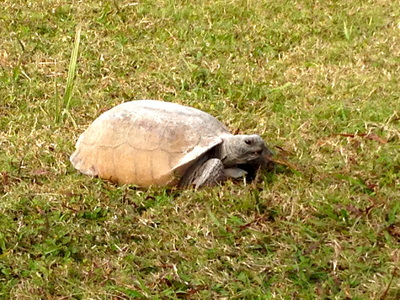 Tom and moved “Evolve” to the Stuart area last November and planned a 6-week long cruise in February. 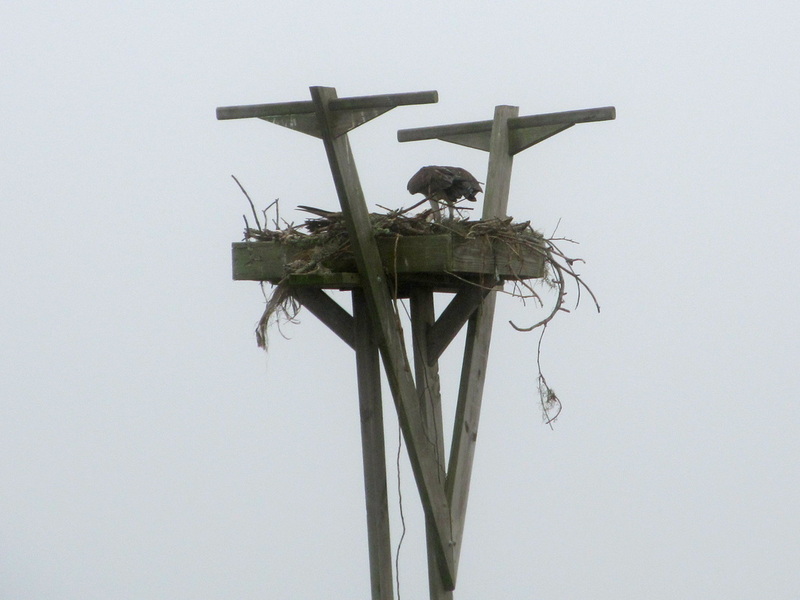 They had flown in from Michigan yesterday. Seeing them was another example of this adventure has been laced with serendipity. We had agreed to meet in the area called the Manatee Pocket. Our destination was the Mariner Cay Marina that Laurie had found on Active Captain.com. Located in the Manatee Pocket, the marina served a gated community but welcomed boaters providing good docks, clean restrooms, and a pool. Andiamo arrived at about 1PM and we backed into the fixed docks in a tricky wind. Larry, the dockmaster, called the security guard at the front gate to allow Tom and Pam in. 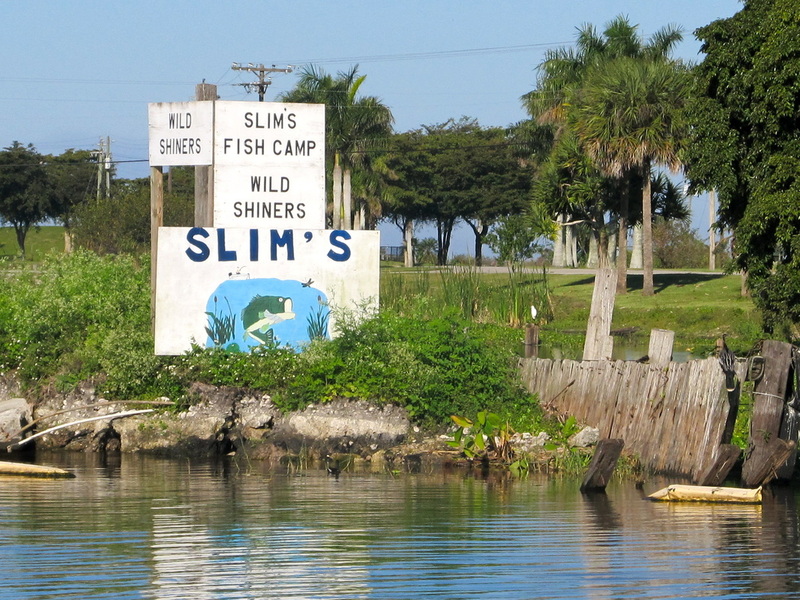 Within the hour, they arrived with their big one-tone truck and after hugs all around; Tom drove us to Shrimper’s Restaurant at the end of the Manatee Pocket. The area is very busy. Tom knew this area very well and he was glad to drive us around and show it off. We spent the afternoon with them and did not see “Evolve” as she was having bottom paint done. Groceries at Publix, fuses at Harbor Freight, a chart book of the ICW from a surplus marine equipment store, and a few items from West Marine filled out the afternoon. After the goodbyes, we had a quiet evening and enjoyed the time and space. 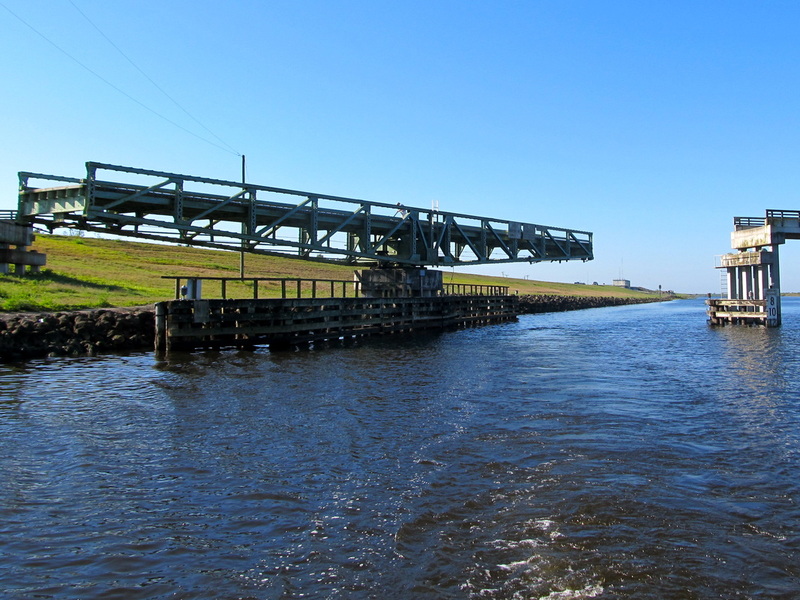 We had completed the Okeechobee Waterway from end to end and cruised 343 miles in 16 days since launching in Tarpon Springs. This is a common speed sign and typically follows one of the variety speed limiting signs. 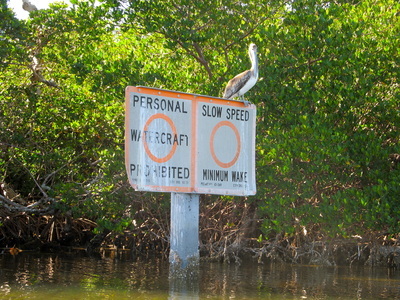 This particular sign is at the start of a canal that is narrower than most with vegetation on the banks. This sign is covers a blanket of behavior. What is normal? What is safe? 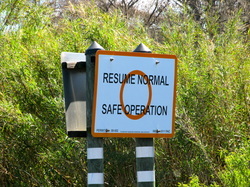 And exactly is "operation?" When something bad happens this sign illustrates the violations that will be applied. When there is too much labeling and not enough specificity, signs like this are common. 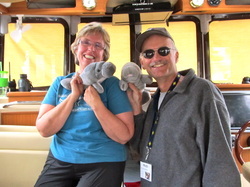 Laurie and Rich and holding manatee dolls or puppets. 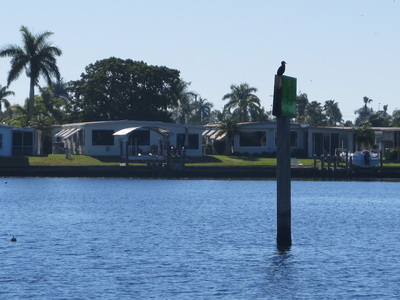 Every marina has manatee education signs and there are many speed zones to slow down for the manatees though, perhaps not coincidentally, these are are in high-end neighborhoods with million plus dollar homes. The contradiction here is Laurie is a manatee lover and is genuinely caressing Manifred. While Rich is doing his best to play the part. 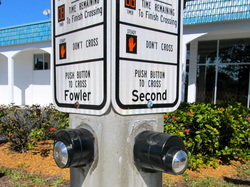 This is a pedestrian crossing at an intersection in Fort Meyers. You have to read these signs carefully because the design was not always the same from one intersection to another. Sometimes the button in front of you was for the signal in behind you and sometimes it was the one for the street on the side. Probably done by a committee or there was a change in Public Works Directors and new orders came done on what the design should be. Having spent my work life in policing, this sign is every cop's dream. It gives the authority to the officer to decide who belongs and who does not. Typically, only the landowner or person in charge has that authority. This something that in all of our travels is totally new. What is this? A plot in a cemetery? This photo was taken at the Lee County Regional Library parking lot in Fort Myers. 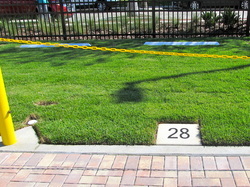 There are parking bumpers, numbered stalls, but it is grass and separated with a yellow chain from the rest of the parking lot. The on-site security guard said he had no idea what is for but it has been this way for five years and though the parking lot is full, no one can park here. You take three words that typically do not go together, morph the meaning of the first, marry them together, and hope that the reader can make the leap to the intended meaning. 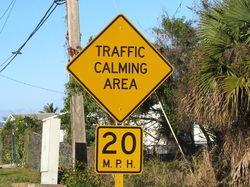 How can traffic be calmed if it is never upset? Oh, and what does this area look like? 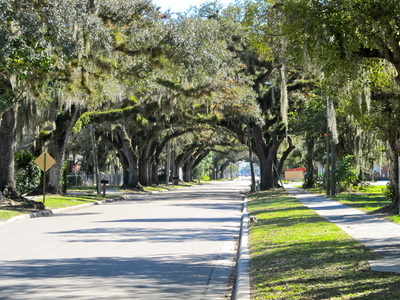 Take a street, make a wide median, put in some brick that changes the texture of the road surface, narrow down the lanes for 200 feet and you have it. All that is missing is some elevator music that is specifically chosen for "traffic."